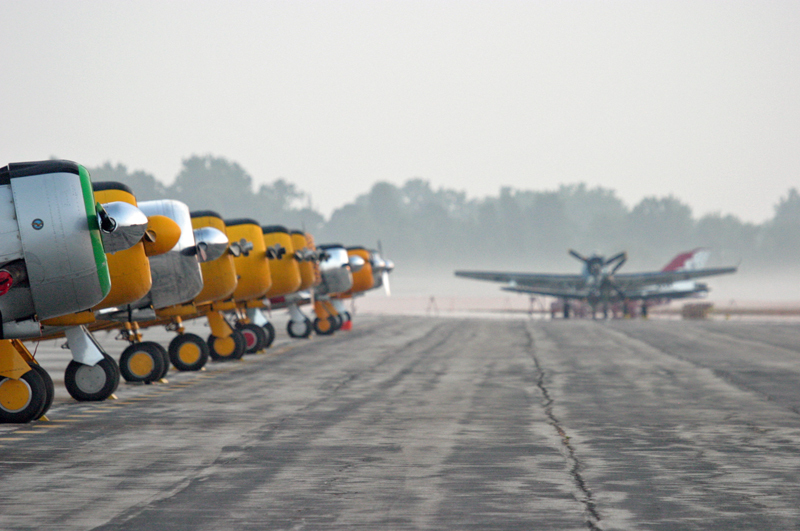 Baltia Thunder Over Michigan 2014: Photo Story. 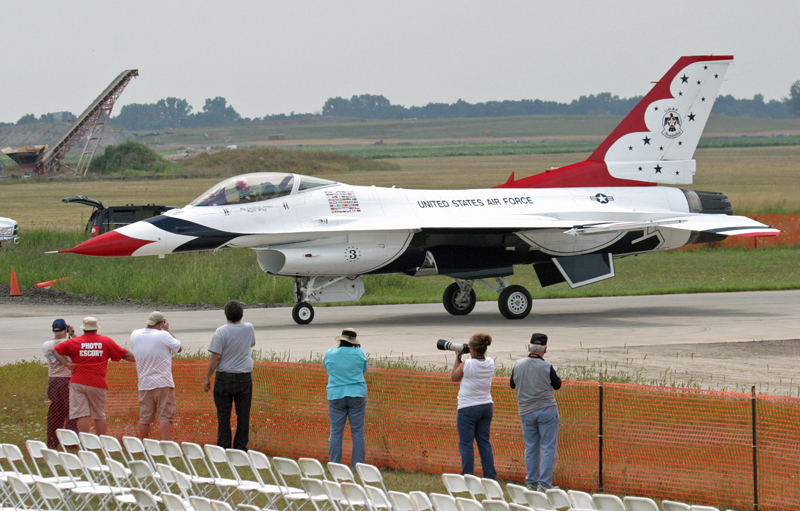 The Baltia Thunder Over Michigan Airshow at Willow Run Airport in Ypsilanti, Michigan on Saturday and Sunday, August 9 and 10, 2014 was one of the largest displays of historic and modern aircraft this year. Most of the aircraft displayed are privately owned, including one of the largest gatherings of T-6 Texan and Harvard trainers anywhere. 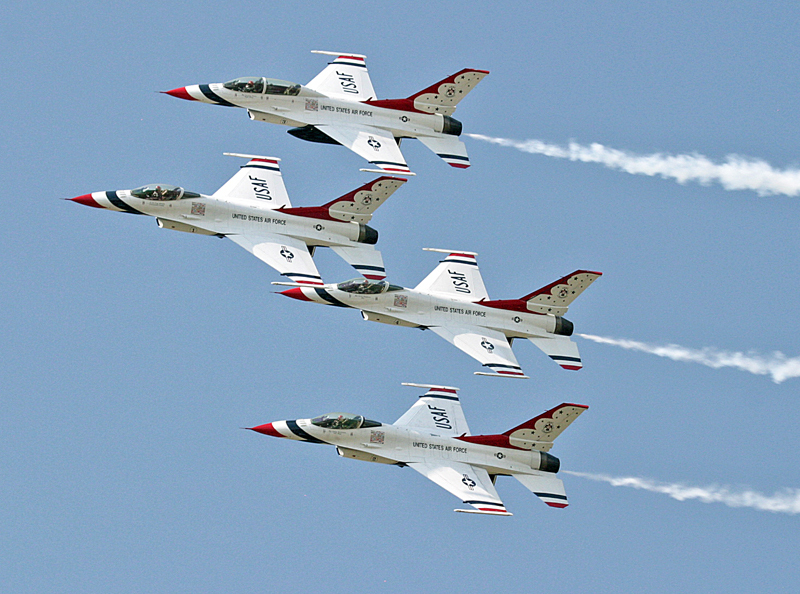 Thunder Over Michigan also featured the U.S. Air Force Flight Demonstration Team, The Thunderbirds, along with the U.S. Army’s Golden Knights Parachute Team and other airshow acts. This is my home town airshow, one of the shows I grew up with, so it was a special event to me. 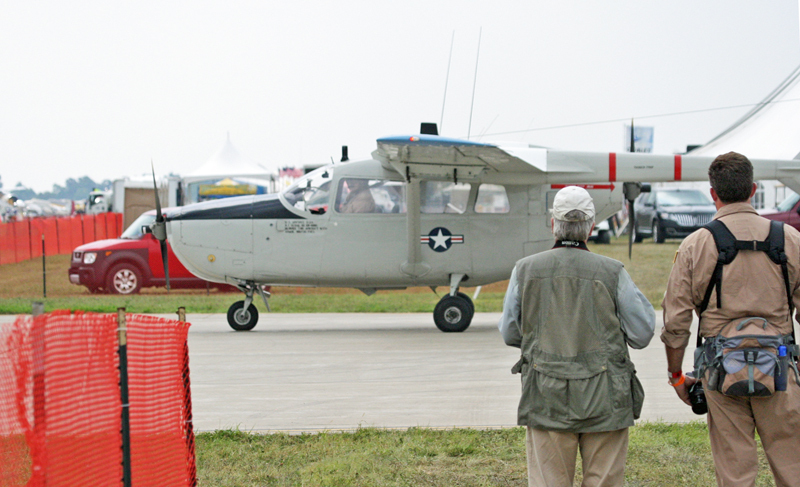 Airshow organizers provided photographers with taxiway passes for special access to the aircraft and crews along with a great hospitality tent with food, drinks, bathrooms and detailed information on every aircraft in the show. Tom Walsh, the coordinator of the photo area, did an incredible job hosting aviation photographers from around the world. The early morning light provided a unique opportunity for photos on both Friday before the show opened and on Saturday, the first show day. This crew (above) prepares the famous B-17G, “Yankee Lady”, that lives at Willow Run Airport as part of the Yankee Air Museum. 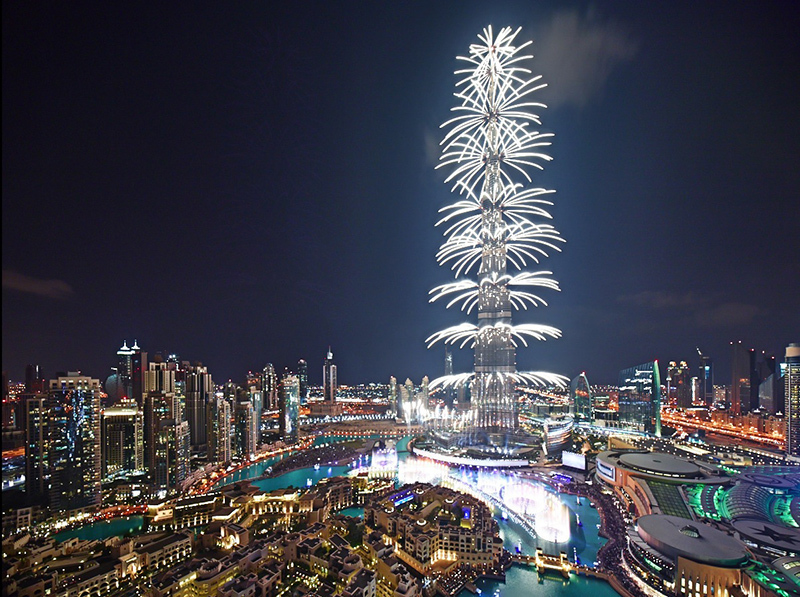 It is a flying piece of history that is beautifully maintained. 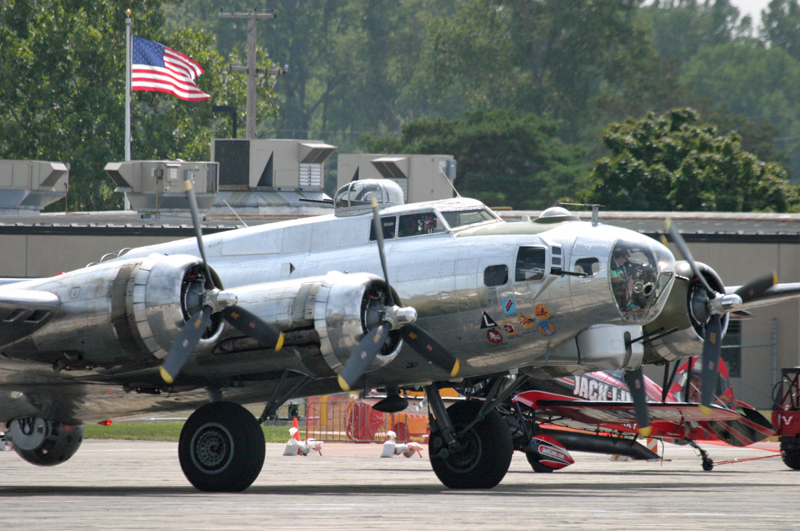 Several years ago I got a chance to fly in Yankee Lady out of Willow Run as a guest. Yankee Lady was built in 1945 and once flew as a Coast Guard PB-1G before being sold at auction for only $5,997 to a smelting company and then to an aerial survey company. It later had a career as an aerial fire bomber and also flew in the filming of the movie Tora Tora Tora about the attack on Pearl Harbor. In it’s current condition the aircraft has been completely restored, including the replacement of all fuel and electrical systems. 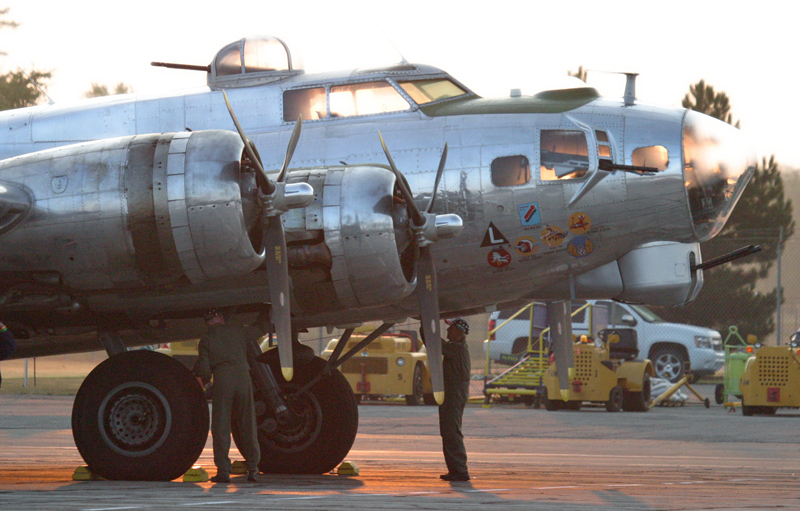 It is seen flying frequently around Willow Run airport. Thunder Over Michigan attracted veterans who were pleased to share stories about the planes and people who built the history celebrated here. 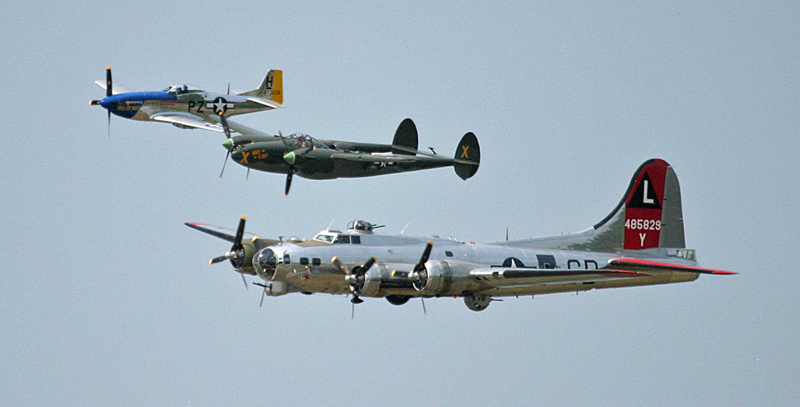 The show crossed aviation eras from before WWII to the modern era. 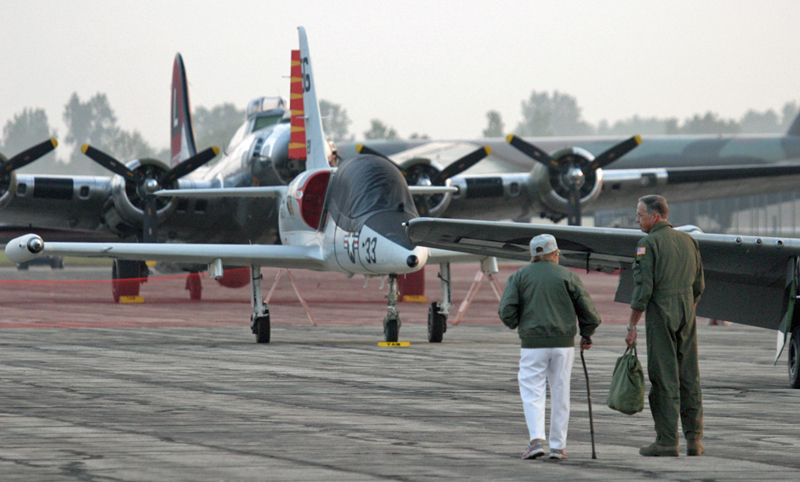 Here a veteran and one of the airshow pilots chat before the arrival of show crowds. 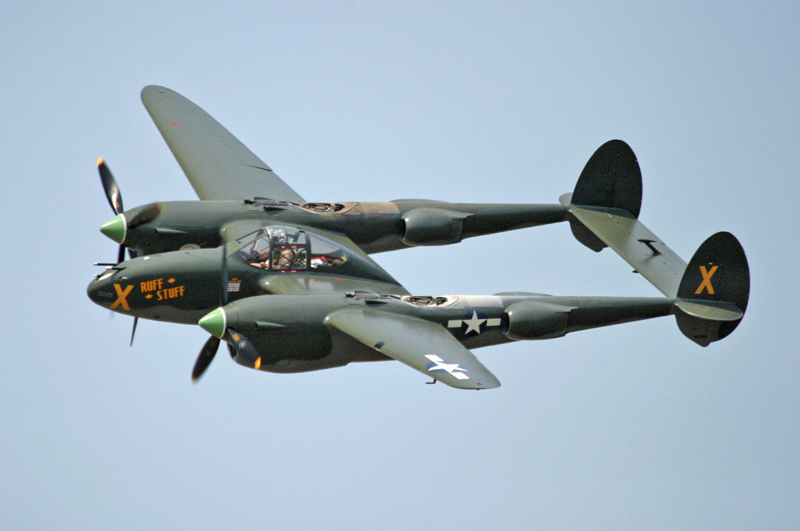 A unique perspective on the “Fork Tailed Devil”, the P-38J Lightening “Ruff Stuff”, belonging to Mr. Ron Fagen of Granite Falls, Minnesota. 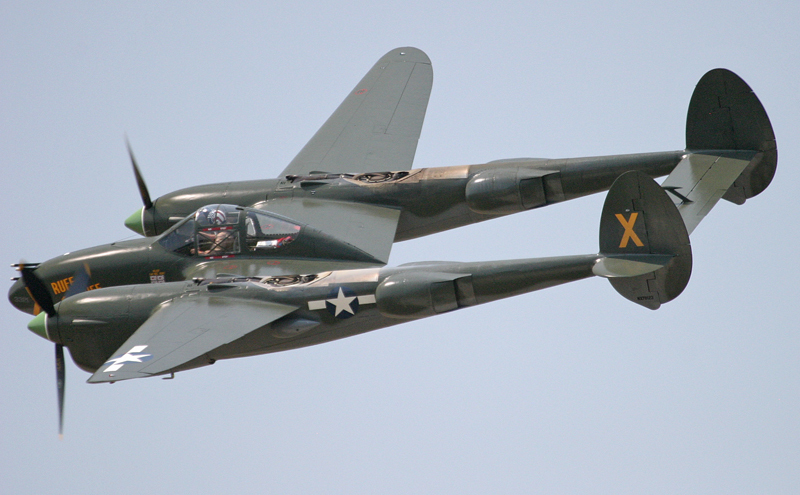 There are only seven P-38 Lightenings left flying and this is the second one I’ve been lucky enough to see. Ruff Stuff was built in 1945 and never saw active service. It has changed ownership several times but its most recent restoration and the stewardship of Ron Fagen in his Fagen Fighters Museum insure its future as a national treasure. We each shot unobstructed photos of the incredible airplanes out on the flight line, an area restricted from the general public on show day during flight demonstrations. 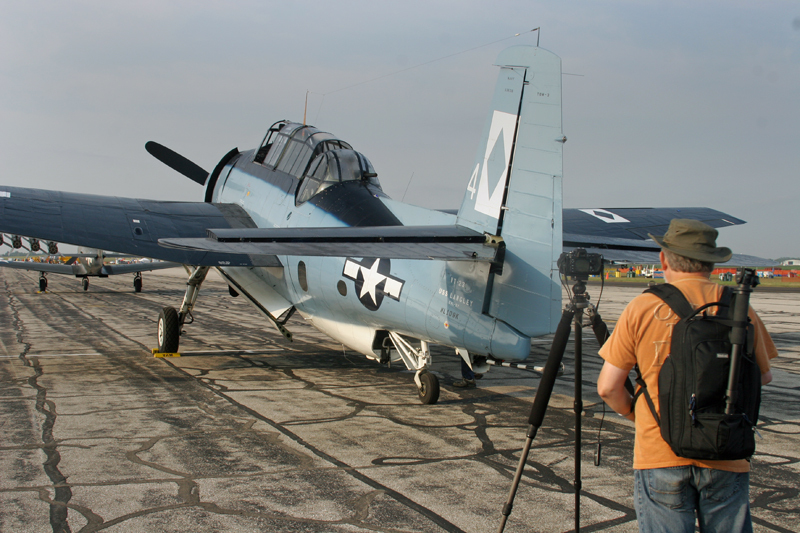 Here we set up his shots of a TBM Avenger torpedo and dive bomber. 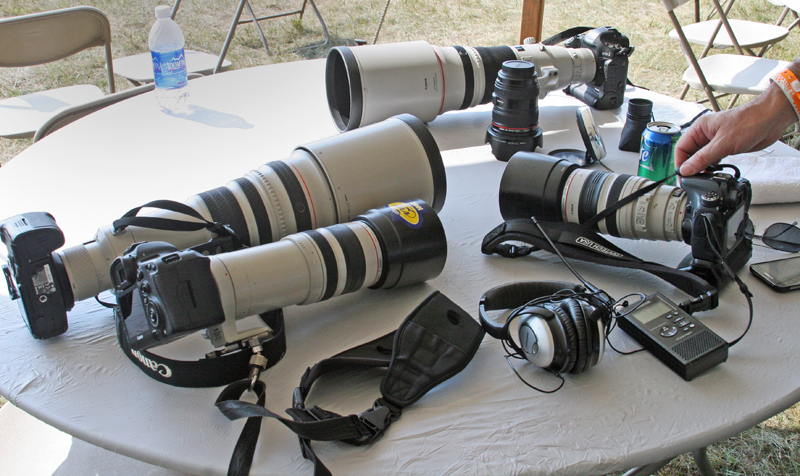 Photographers brought an impressive array of photo equipment to capture the action. We used aviation band scanners to listen in on aircraft communications and air traffic control radio from the show Air Boss. 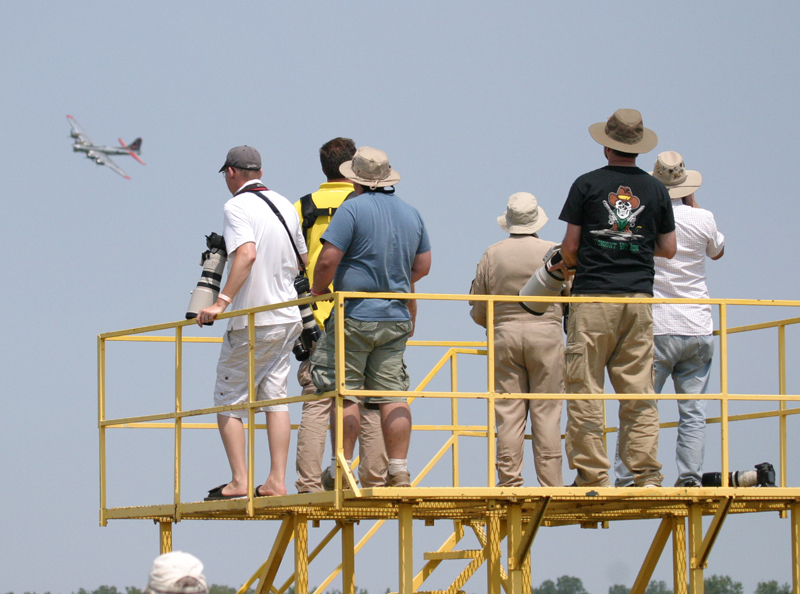 Shooting aircraft requires big telephoto and zoom lenses to capture the action. Canon equipment outnumbered Nikon significantly. Monitoring the show and airport air traffic control enabled us to set up shots before aircraft arrived, especially helpful with fast jets. 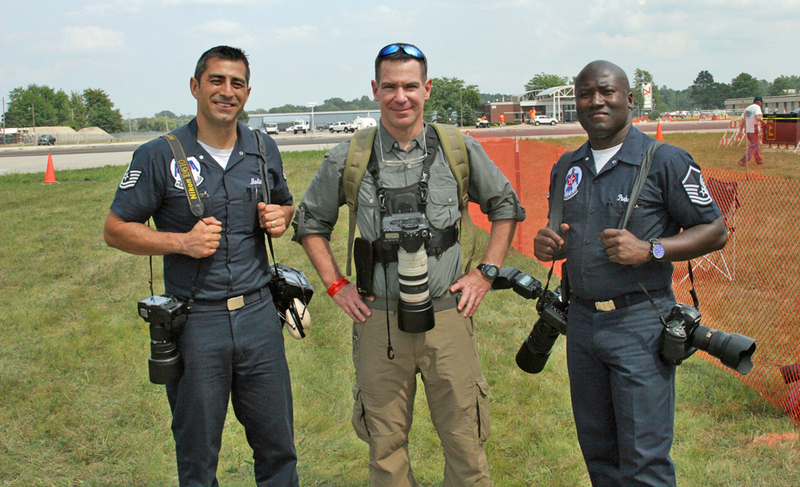 All the photographers enjoyed the same access to the field as the official Air Force Thunderbird photographers Manuel Martinez (left) and Stan Parker (right). I got a chance to grab a photo with these guys as they worked and even got a few tips on aviation photography from two of the best guys in the business. 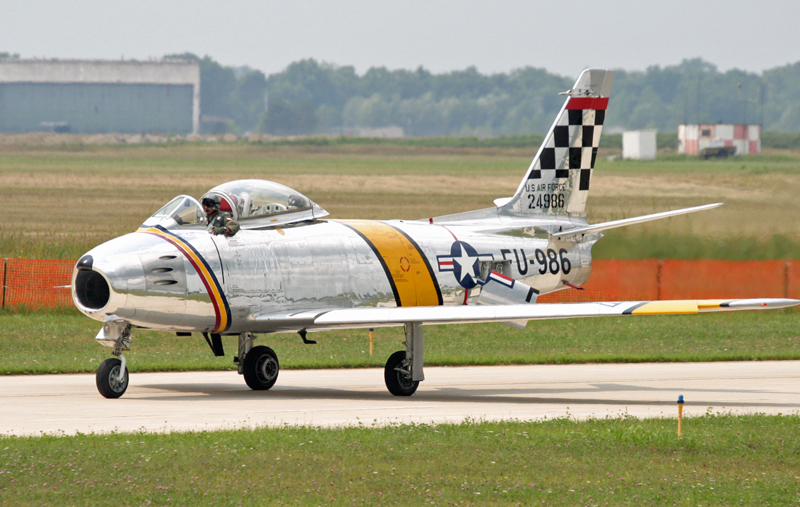 Friday, August 8, was arrival day for many of the aircraft in the show, with planes flying in from all over the U.S.. A highlight was this F-86F Sabre, “Smoky”, owned by Paul Wood from Waukegan, Illinois. The restoration and maintenance of this Korean War era jet is impeccable and it is a favorite of photographers. The aircraft was first owned by the U.S. Air Force then sold to the Fuerza Aerea Argentina or the Argentinian Air Force in 1960. 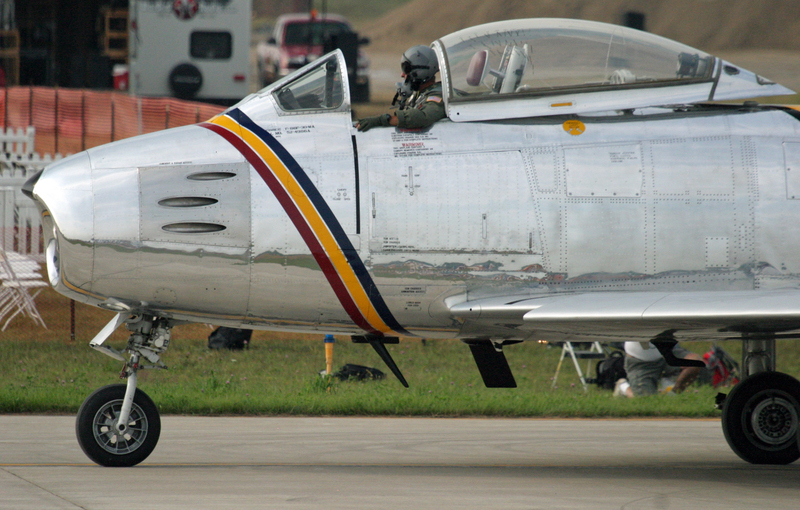 It was later acquired privately in the U.S.
Paul Wood taxis his F-86F Sabre into the parking area. Notice the open speed brakes and the three holes for the .50 caliber machine guns. 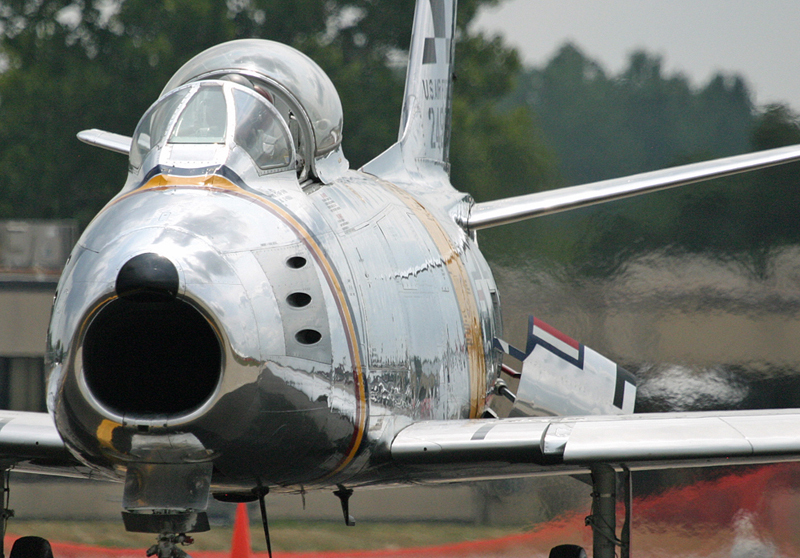 The F-86F has a natural metal finish that is difficult to maintain but brilliant to see on a sunny day. The bubble canopy of the F-86F provided pilots with excellent visibility and inspired the design of the canopy on the most recent fighters including the F-22 Raptor. 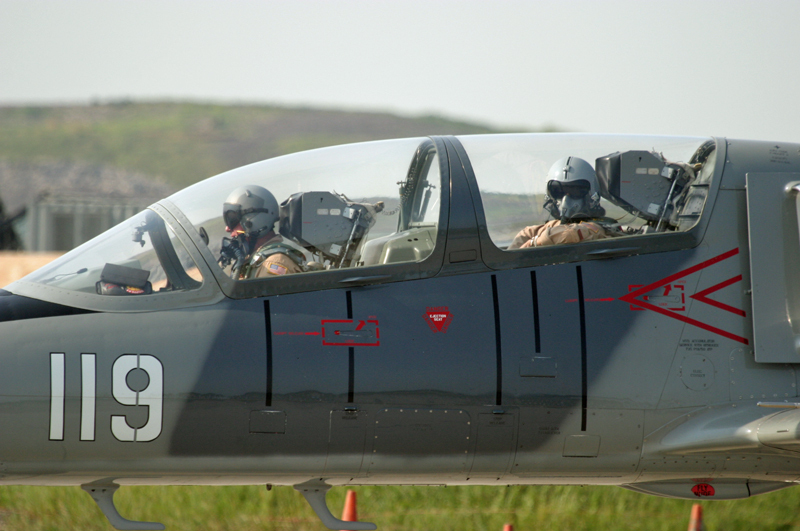 Pilots like to taxi with the canopy open for ventilation but must duck down to close the canopy fully. 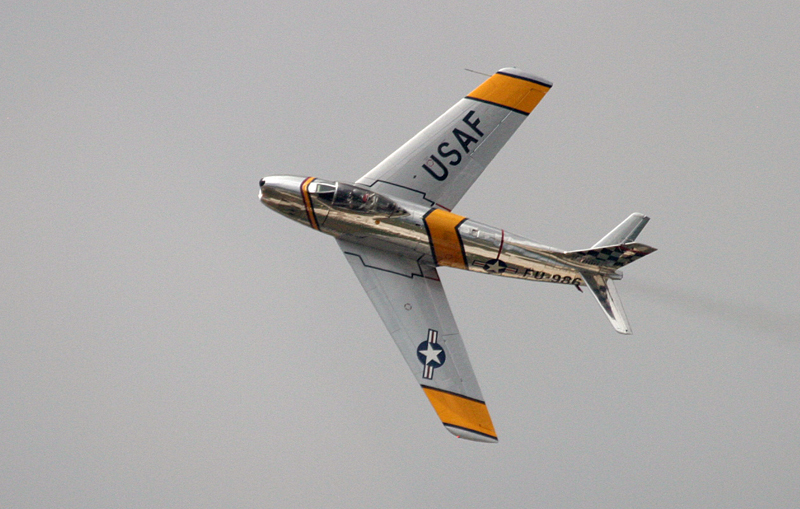 Paul Wood cranks his F-86F through a flight demonstration that showed the maneuverability and thrust to weight ratio of the F-86F. Considering this jet was built in the late 1940’s it remains an impressive performer. The F-86 was the first fully operational U.S. jet fighter with swept wings. 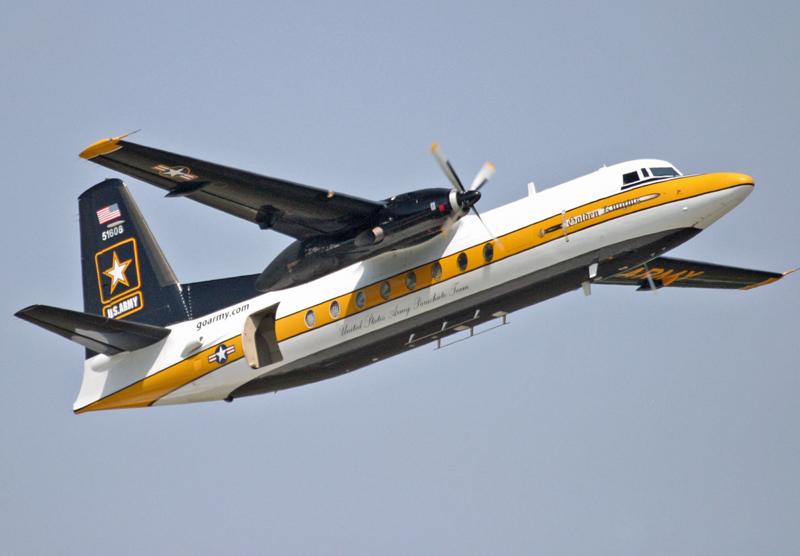 A few minutes later the U.S. Army Parachute Team’s C-31A Troopship flew into the pattern at Willow Run for a landing. The pilots obliged photographers with a low pass before final approach. This is a nice sounding, Rolls-Royce powered aircraft built by Fokker. It can carry up to 25 jump equipped soldiers for demonstrations. We had excellent access to active taxiways throughout Friday and were accompanied by helpful “safeties” who kept us from getting run over by aircraft when we were looking through a camera viewfinder. It was a remarkable experience to be so close to the aircraft as they came and went during arrival and show rehearsal. 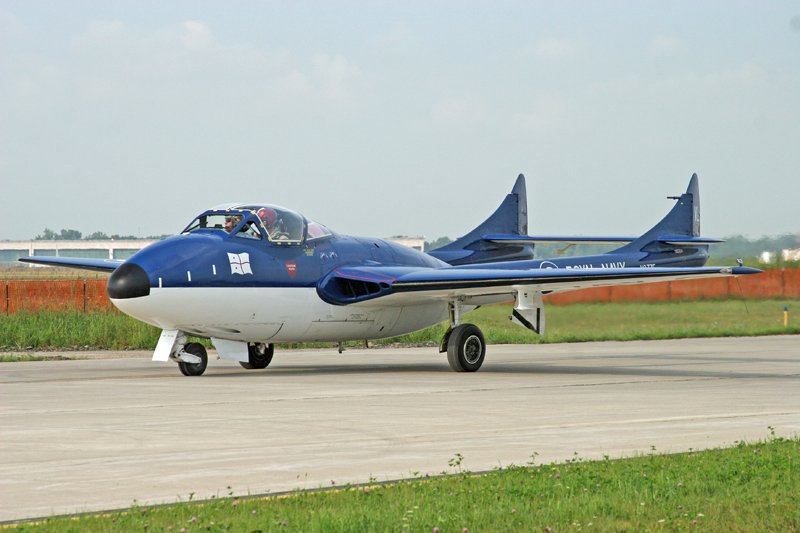 This unusual aircraft is the de Havilland DH-115 Vampire formerly of the Royal Navy and now belonging to Marty Tibbits of Detroit. It is a pretty, unusual aircraft that operated from Royal Navy aircraft carriers after 1945 and also served, in a different version, with the Royal Air Force. The Vampire, in its many versions, was a successful aircraft that was flown by several countries through the 1990’s, including, oddly enough, Rhodesia. If there was one perfect P-51D Mustang at the show it was Mark Peterson’s “Hell-er Bust” from Boise, Idaho. The aircraft is painted in a photogenic livery and carries a pair of simulated 500 lb. general purpose bombs. Here Mark taxis in after his arrival on Friday. Hell-er Bust has an impressive history since being built in 1945 at the North American Aircraft plant in Inglewood, California. She first joined the legendary 8th Air Force in 1945 but was transferred to the Swedish Air Force in 1948 and the to the Dominican Republc from 1952 to 1984, making it one of the last remaining truly operational Mustangs while in service with the Dominican Republic. Hell-er Bust uses the classic Packard Merlin V-1650-7 engine that produces that goose bump-inducing Mustang sound. 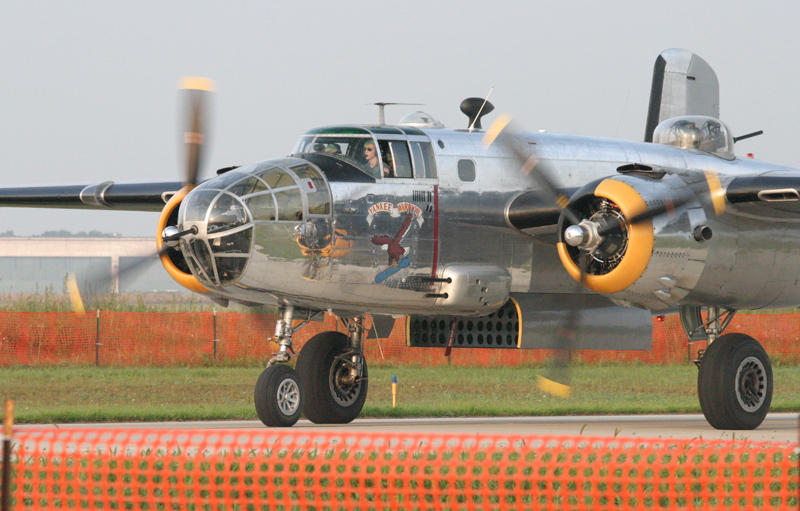 The B-25D “Yankee Warrior” is one of the planes that lives at Willow Run as part of the Yankee Air Museum. We are lucky enough to see it fly around the airport occasionally and got a good look at it on reception day. 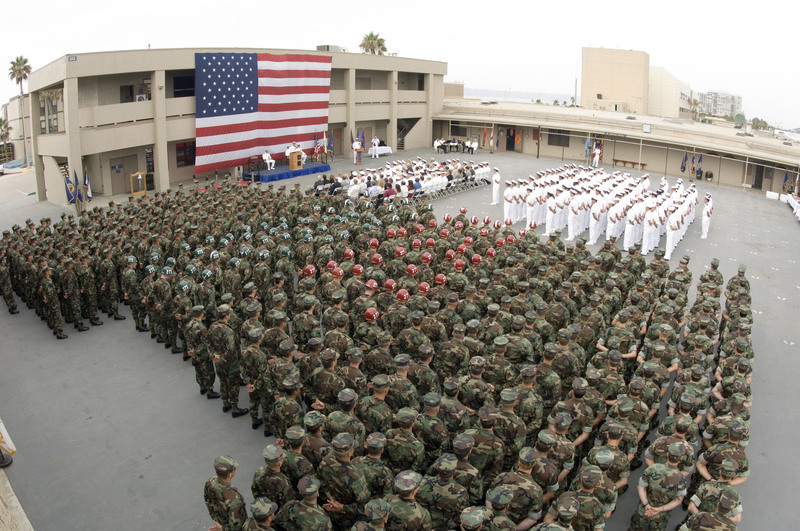 Five of its .50 caliber machine guns are visible in this view. Yankee Warrior is a combat veteran of WWII, having flown eight bombing missions over Italy before it was retired, then restored. Yankee Warrior had a rather attractive pilot flying on arrival day and was meticulously turned out in its natural metal finish. This B-25 is a frequent visitor to air shows around the U.S. but I never found out who the pilot pictured here is. 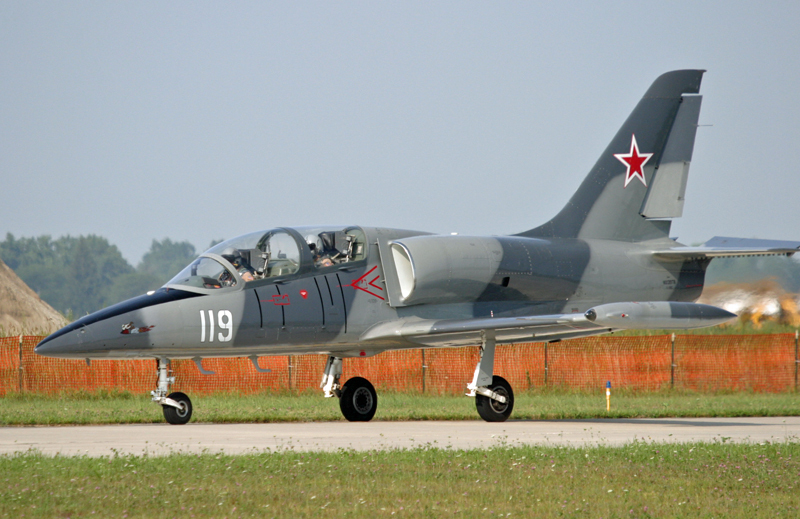 A number of exciting private jets flew in on Friday including this Aero Vodochody L-39C belonging to Tim Brutsche of Battle Creek, Michigan. Brutsche owns Brutsche Concrete in Battle Creek and is a licensed Air Transport Pilot (ATP) who has been an active promoter of youth in aviation for years. Here is Tom and his co-pilot, perhaps his wife Beth Franklin-Brutsche who frequently flies with him, taxiing their L-39C to its parking ramp. Aircraft owners spent time on Friday chatting with photographers and polishing their airplanes for the show opening on Saturday. 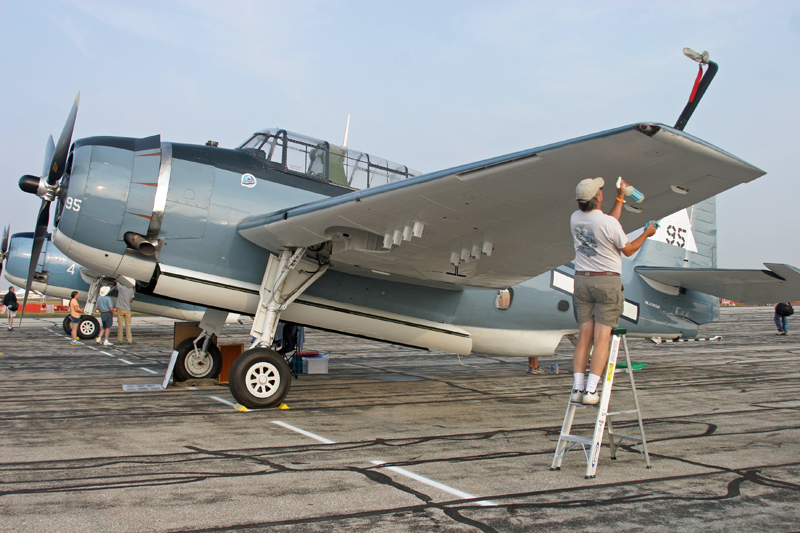 This TBM-3E Avenger gets a shine in the morning. The P-47D Thunderbolt “Jacky’s Revenge” was restored from former Peruvian Air Force service in 1966 and painted in U.S. livery with D-Day invasion stripes on the wings and fuselage. There were so many T-6 Texans, Harvards and this AT-16 Texan from Blanchester, Ohio it was hard to pick just one to photograph, but this bright orange and yellow paint scheme stood out from the other aircraft. We got a raised maintenance platform to shoot photos from each day, making it easy to get great shots of aircraft taxiing and of the flight demonstrations. Each of the photographers took turns in a corner. We used a pilot band radio receiver to help locate inbound aircraft. When one photographer would see an aircraft inbound to the demonstration field they would shout out, “Aircraft, inbound, from the east…” for the other photographers to get their shot. An operational German Luftwaffe Transall C-160D from Air Transport Wing 61at Penzing AB, Germany made a special visit to the show. 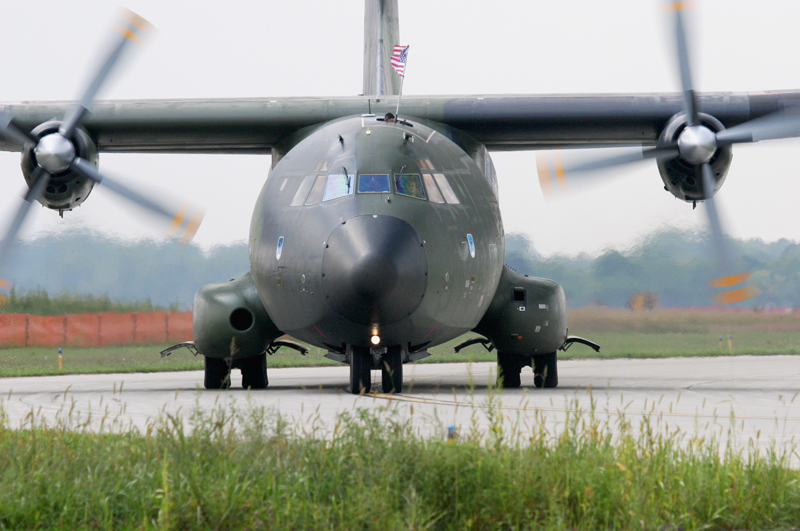 The Transall is a workhorse twin-engine tactical transport that serves air force around the world and is especially prolific in Europe and Africa. It makes a pretty “whirring” noise like a mini-C-130. 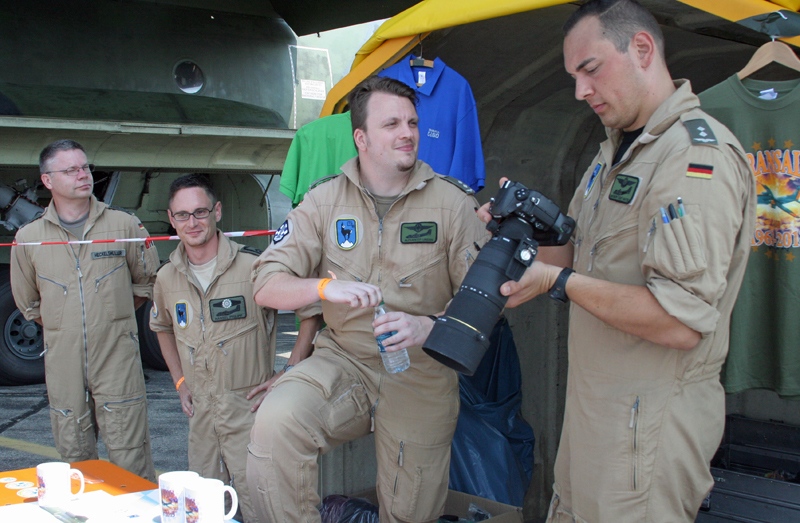 The flight crew of our visiting German Transall were happy to be at the air show and brought a big tent filled with their squadron mugs, T-shirts, patches and other memorabilia. They enjoyed chatting with the crowd in English and in German and also had fun shooting photos of the other flight demonstrations while they earned some cash selling souvenirs. 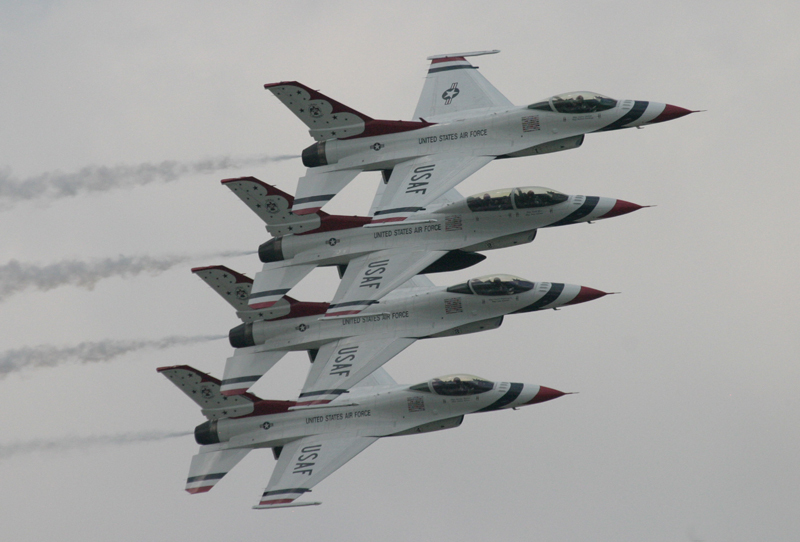 Friday was a relaxed day and a chance to meet the Thunderbird pilots in person without any fences. 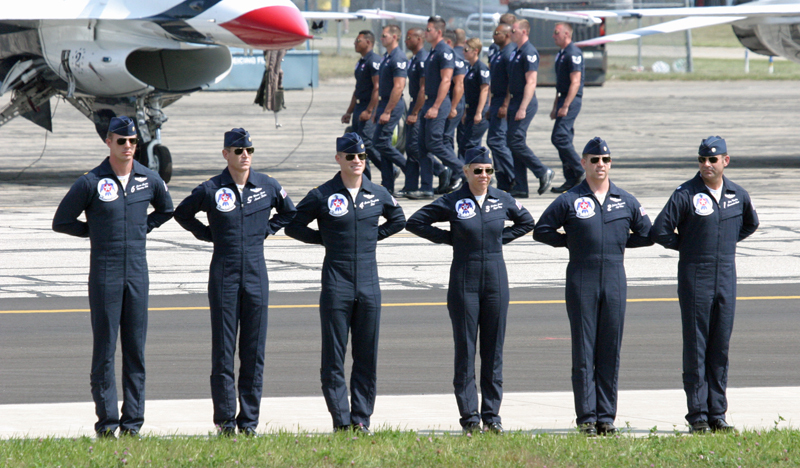 I caught the entire flight demonstration team here for a candid group shot here. Thunderbird #6 Opposing Solo, Major Jason Curtis of Kalispell, Montana, taxis out for Friday practice. He is a drummer and competitive snowboarder and graduated from the U.S. Air Force Academy in 2004. 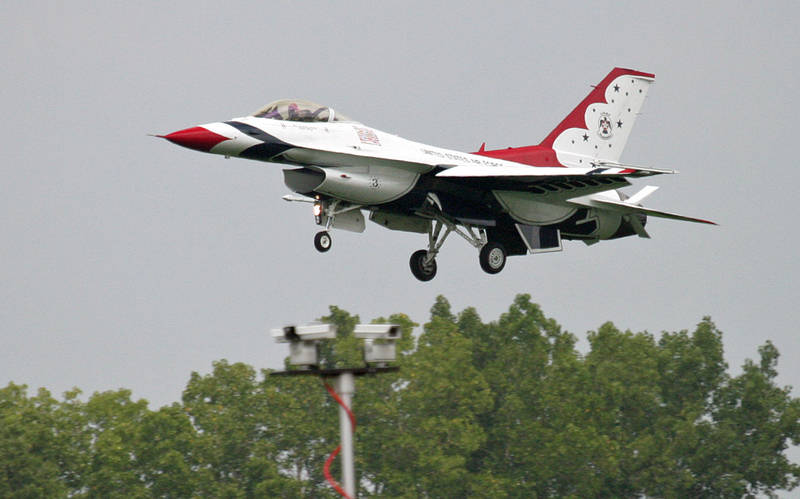 Thunderbird #1, Lt. Col. Bob Moseley taxis out for flight demonstration practice on Friday. The names of the enlisted flight maintenance crew for this aircraft are painted on the right side of the cockpit with Lt. Col. Moseley’s name on the left side of the aircraft. 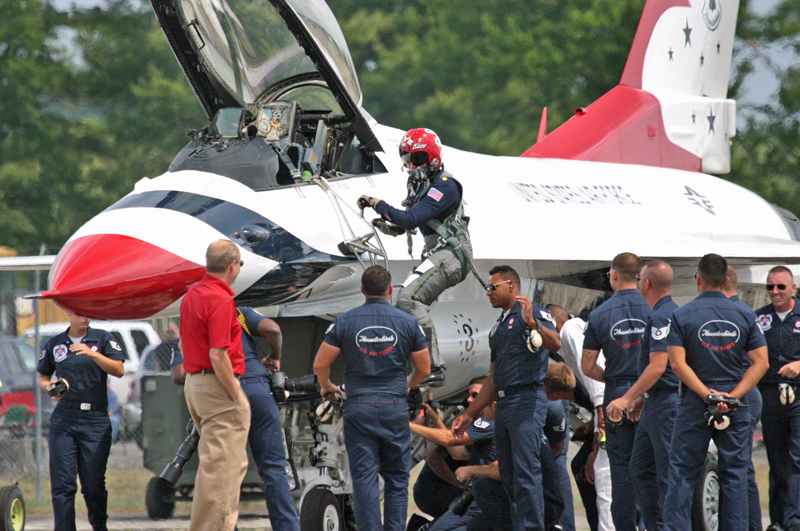 Moseley is a graduate of Virginia Military Institute and has flown both the F-15 and F-22. 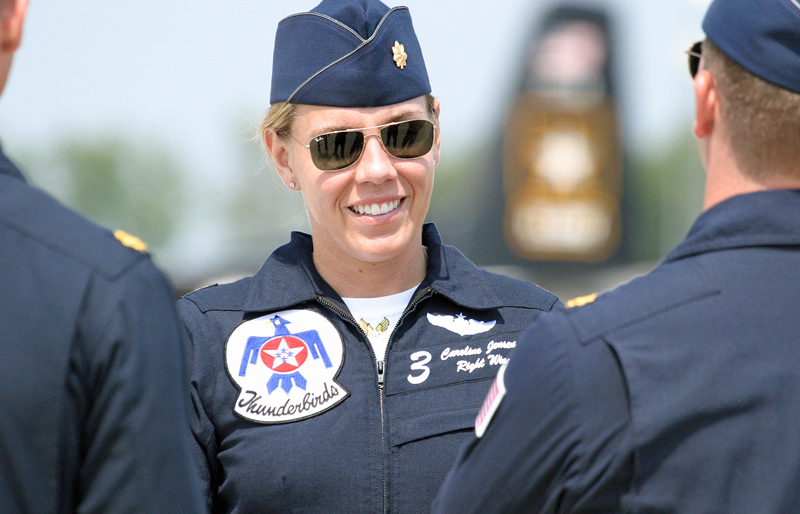 We had an interesting incident on Friday, practice day, when Thunderbird #3, Maj. Caroline Jensen, had a “bird strike”, sucking a bird into the intake of her F-16. The bird damaged the engine and caused her to safely circle the field and make an expedient landing. Major Jensen taxied past the photo stand on her way back to the flight line to switch to the reserve aircraft that was already preflighted by the Thunderbird ground crew and ready for engine run-up. She quickly climbed down from the damaged #3 aircraft and ran to the waiting reserve aircraft while the ground crew began to survey the damage to her F-16. 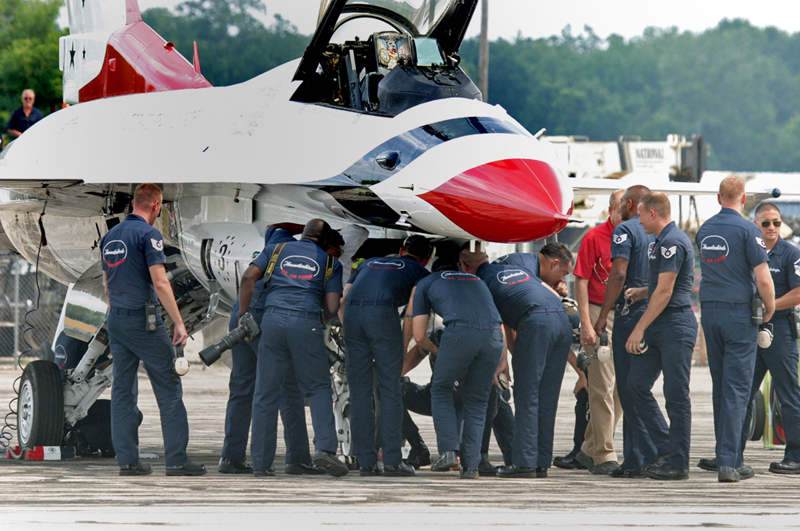 All of the Thunderbird ground crew wanted to see the damage to the inside of the F-16 intake from the bird strike. 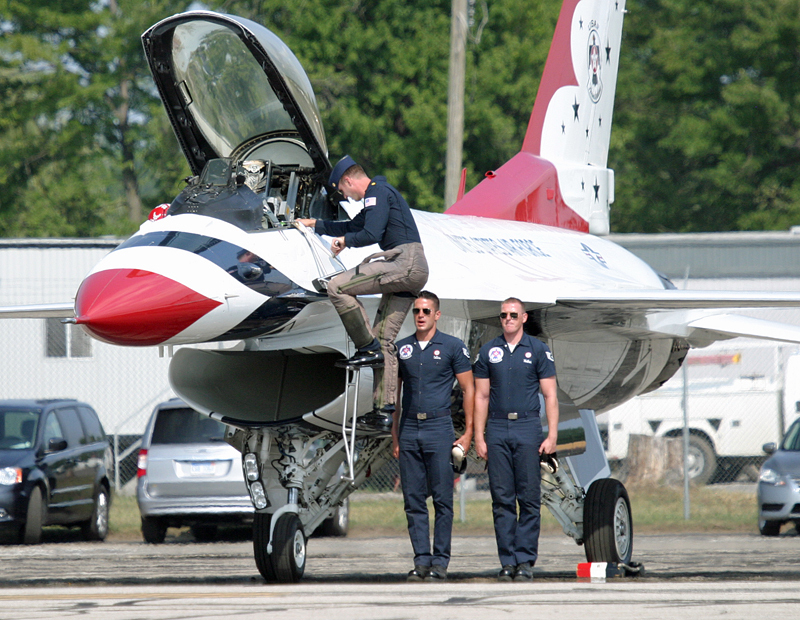 The man in the red shirt is likely the aircraft engine manufacturer’s technical rep who travels with the Thunderbirds, Mr. Tom Eshelman from Pratt & Whitney aircraft engines. That a jet engine can withstand a high speed bird induction through its turbine fans and continue to fly safely is an impressive accomplishment by Pratt & Whitney. 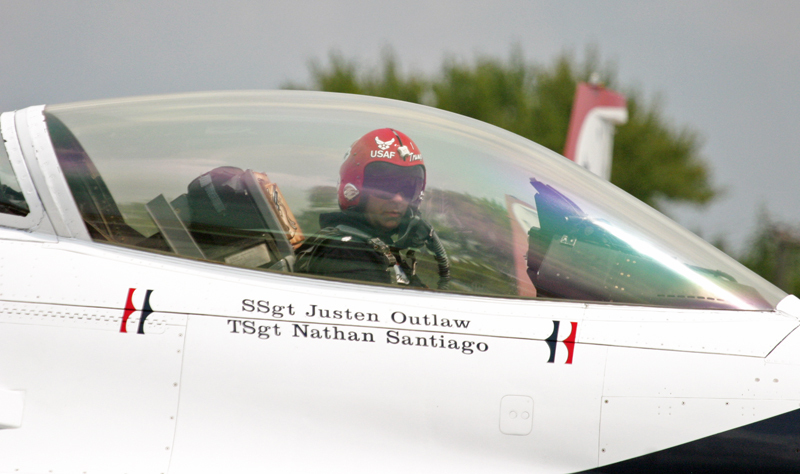 Major Jensen climbs up to the reserve F-16 to rejoin the demonstration formation after running to the alternate jet that was already preflighted by the Thunderbird ground crew. Lighting conditions on Friday practice for the flight demonstration were poor with flat and overcast skies. It was less than ideal for good photos. We enjoyed the practice after shooting a few photos and checked the weather for Saturday, hoping for better lighting conditions for aerial photography. The weather on Saturday started misty but the fog burned off quickly as crews got their aircraft ready for the first day of the show. 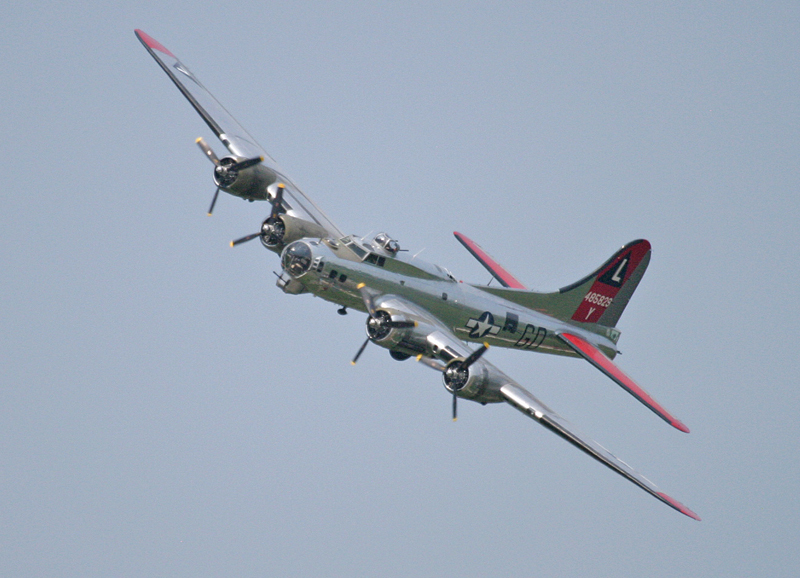 I liked this shot of the B-17G Yankee Lady with the U.S. flag in the sky overhead. 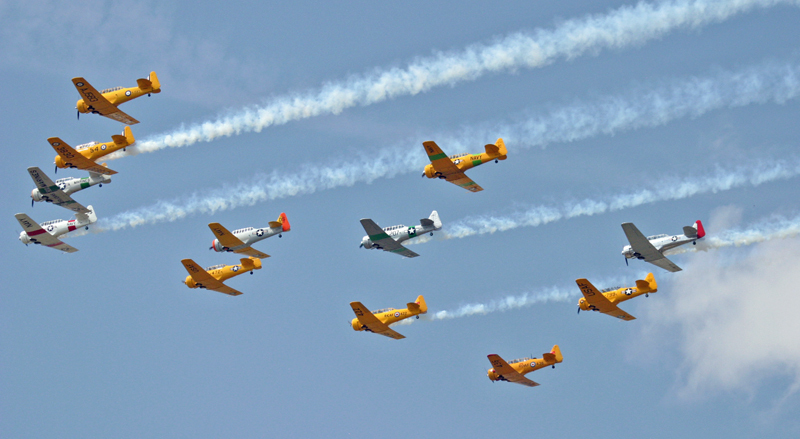 The first big flight demonstration was an giant formations of T-6 Texans and Mk IV Harvards. This is only half of the total formation. The combined sound of their radial engines was an amazing recollection of what it was like to be near one of the big WWII fighter training bases. The formation flying continued throughout the morning with an intricately coordinated double-racetrack pattern of aircraft flying over Willow Run. This tight formation of a P-38, P-51 and the B-17 G Yankee Lady is a living display of air power over the Pacific and the European theaters during WWII. I can’t help but wonder what the view from inside the cockpit must be like. 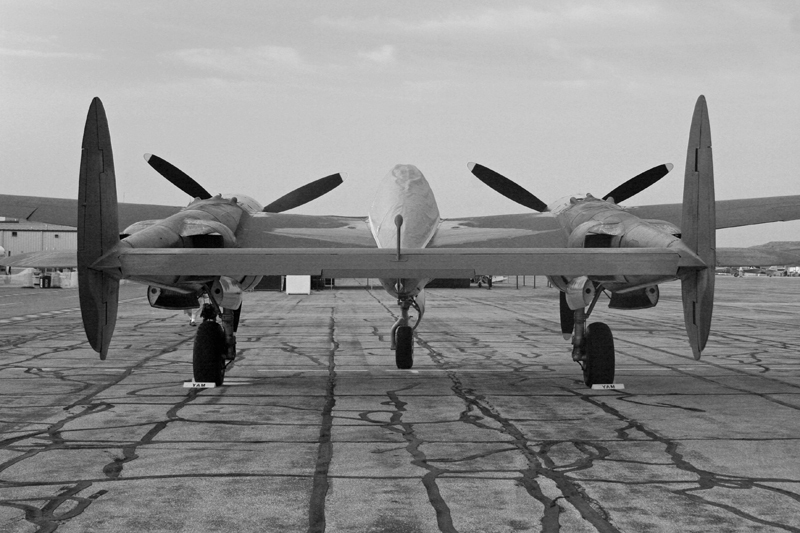 Ruff Stuff, the Lockheed P-38, did a few photo-pass fly-bys for photographers, giving us the opportunity to shoot photos from different angles. P-38 Lightening Ruff Stuff as viewed from the rear quarter. Notice the superchargers on top of each of the engine booms. The chunky looking P-47D Thunderbolt, predecessor to the modern A-10 Thunderbolt II, becomes more graceful in the air. 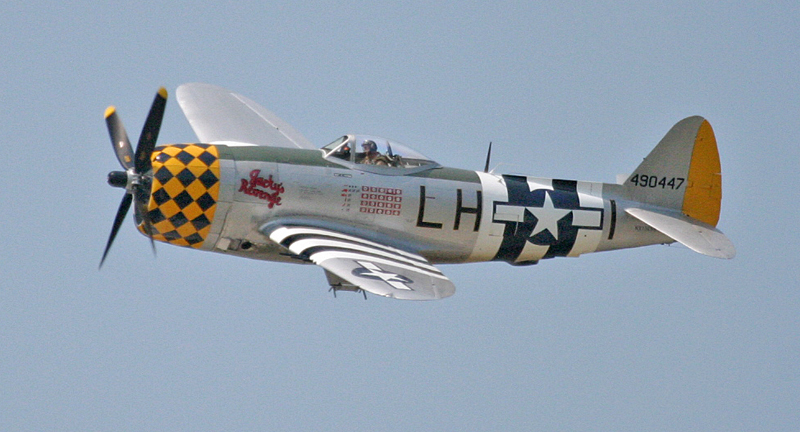 The P-47D was used extensively in the ground attack role. 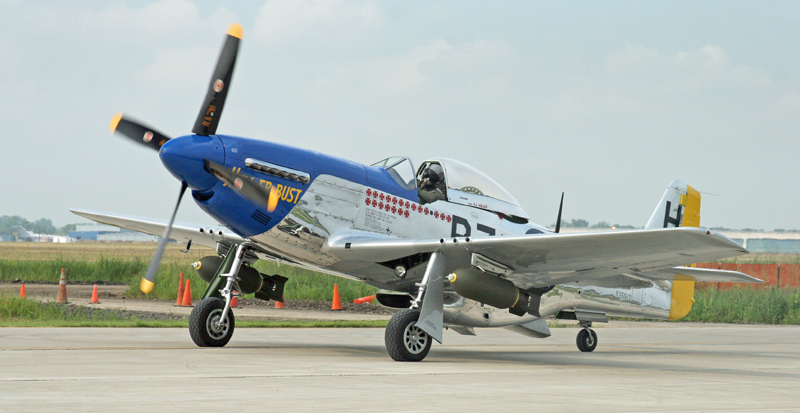 The black and white stripes on the fuselage and wings are called “invasion stripes”. These helped other allied aircraft identify each other following the D-Day invasion to prevent them from shooting at each other and prevented ground crews from shooting at them. 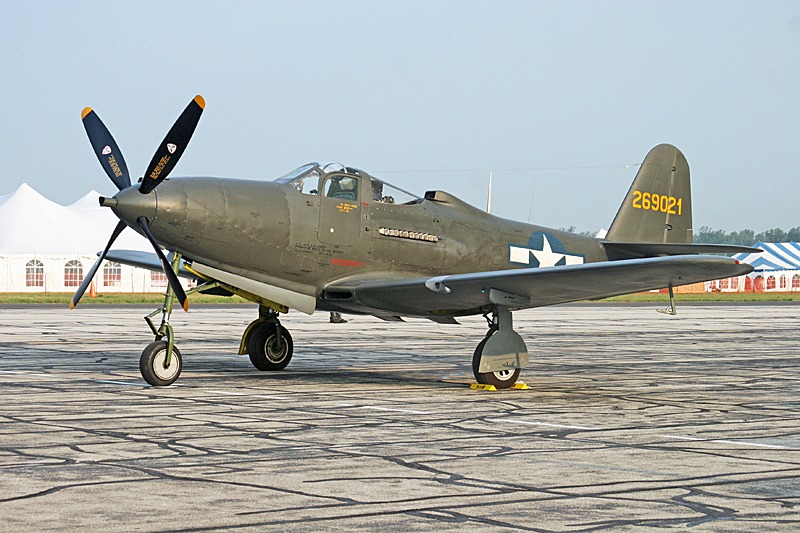 This P-63 King Cobra has a number of unique features including a centrally mounted M-37 30 mm cannon that fired through the propeller hub and an engine located directly behind the pilot. The pilot enters the aircraft through a side-hinged door, not a sliding canopy like the P-51 and P-47. Notice the intake for the centrally mounted engine immediately behind the cockpit. The tricycle landing gear was unique to the P-63 and its less successful little brother the P-39 Airacobra. Most P-63’s saw service with the Soviet Union, over 2,000 of the total of approximately 3,000 built were given to Russia by the U.S. under a lend-lease agreement. Russian pilots actually downed several Japanese planes in WWII with King Cobras. B-17G Yankee Lady turns in toward the crowd line. The “G” model B-17 had several upgrades over the precious “F” and “E” versions, most notably the forward facing chin turret with two Browning .50 caliber machine guns to prevent aerial attack from the front. This side view shows a puff of smoke from one of the B-17G’s engines and a good view of the ball turret under the aircraft. 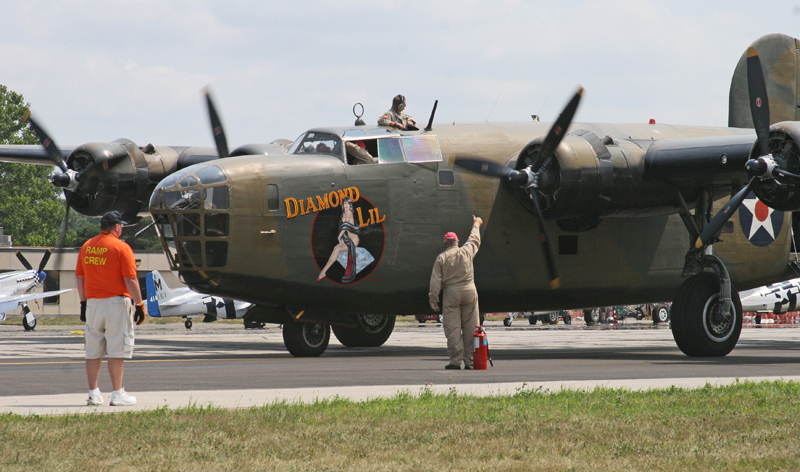 B-24 “Diamond Lil” has a fascinating history as one of the very early B-24A bombers built. The aircraft had a landing accident during its ferry flight to England in the early 1940’s and had to be returned to California for repair. It was converted to a C-87 transport, a modification that likely enabled it survive the war. It went on to be restored as a B-24 with the paint scheme seen here. 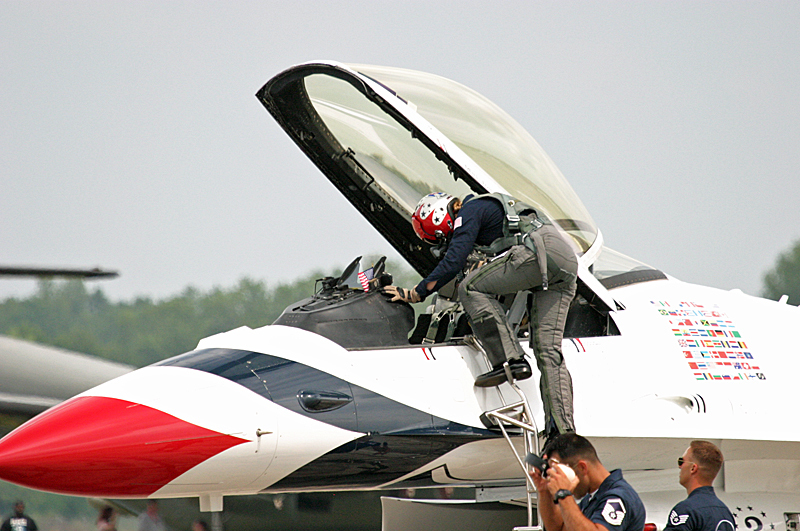 In this photo the crew is initiating engine start and run-up for its flight demonstration. Following the flight demonstrations by the historic aircraft the Thunderbirds held the briefing for their demonstration flight. Here Major Caroline Jensen listens in before the beginning of the demonstration routine. 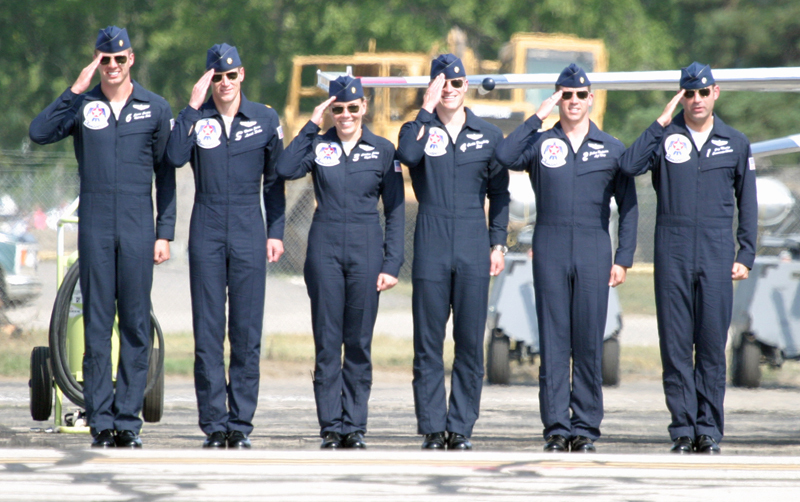 The Thunderbird diamond and solo pilots salute the crowd at the beginning of their flight demonstration routine. Introductions of the pilots to the airshow crowd over the PA begin the show as the ground crew forms up for the demonstration in the background. 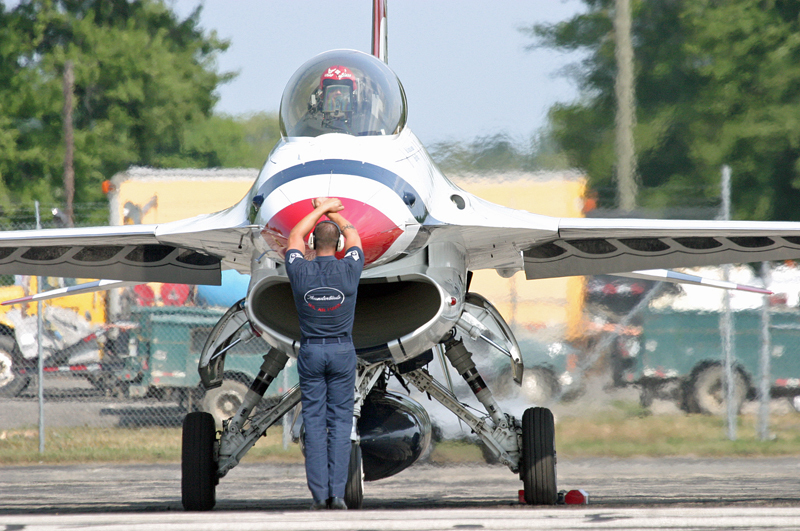 From the preparation of the flight to the aerial maneuvers the entire show is carefully choreographed with impressive precision. Wearing a pair of G-suit pants the pilots climb the ladder to the cockpit while crew chiefs stand ready to prepare the aircraft for take-off. 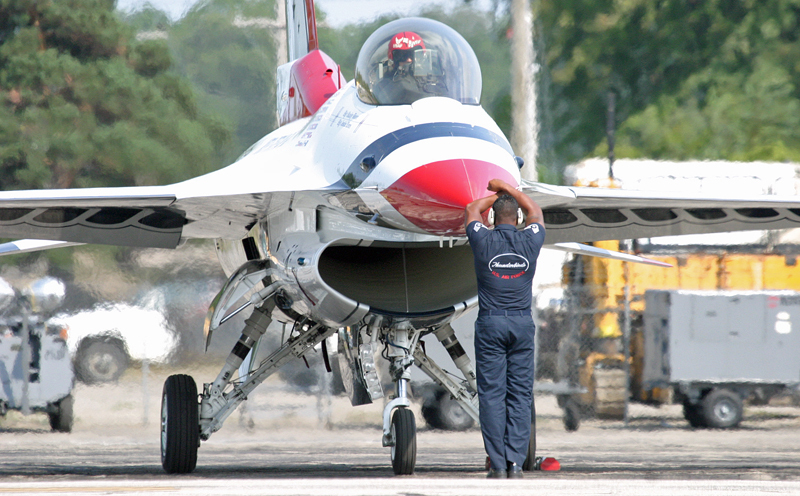 Engine start completed, Thunderbird #1 prepares to taxi to the active runway for take-off. 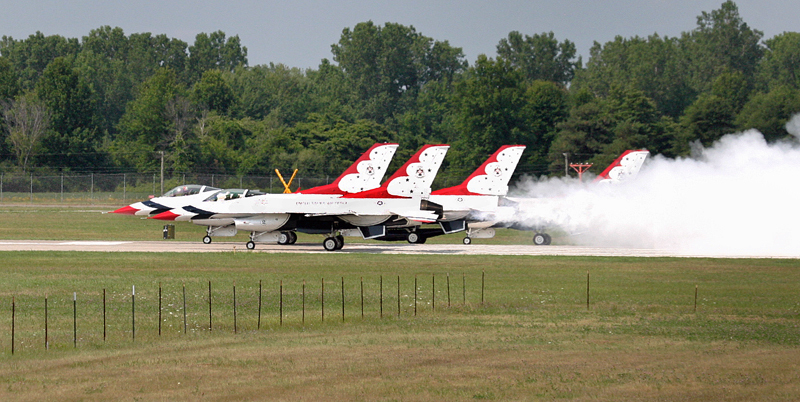 With a plume of smoke the four-ship diamond formation begins their takeoff roll at the start of the flight demo routine. The opposing solo aircraft, Thunderbird #6, Maj. Jason Curtis, turns in across the crowd line as he closes on the the lead solo aircraft for one of their head-on passes. Blue skies and better light gave us a chance to grab good photos of the Thunderbird diamond formation as it flew by the photo stand near show-center. Lead solo Thunderbird #5 Maj. Blaine Jones turns in toward the crowd line for a high-speed pass. 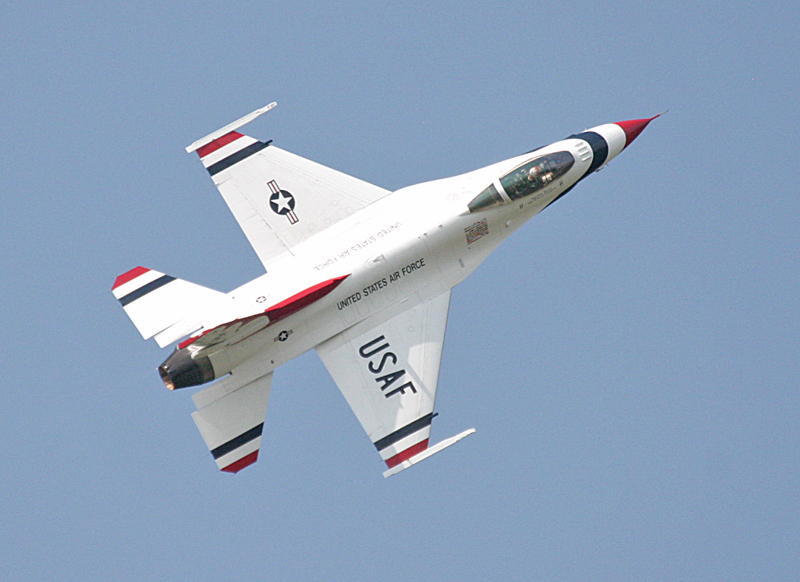 Thunderbird #6 demonstrates a five-point hesitation roll and gives a good plan-form view of the F-16. 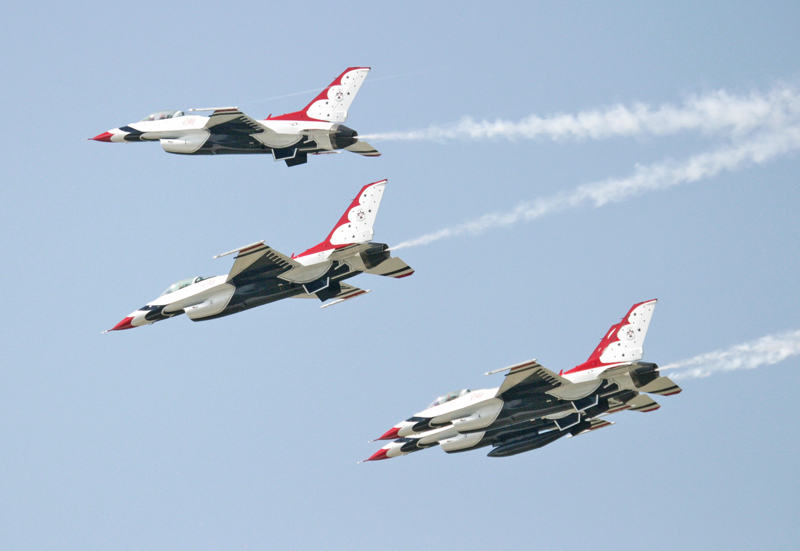 The paint scheme of the Thunderbirds aircraft is specially designed so the crowd can see the aircraft roll from a distance. The Thunderbird diamond formation at the top of an inverted loop at an altitude of about 2000 feet above ground level. 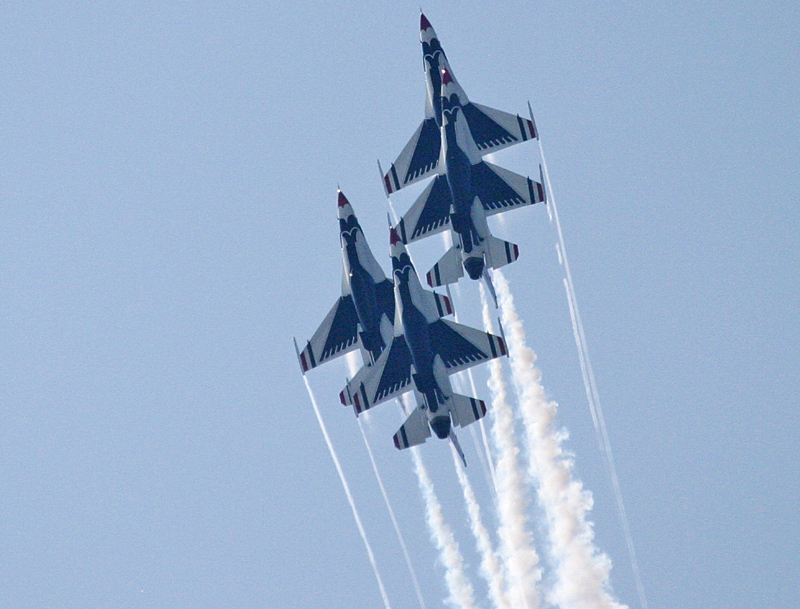 The Thunderbirds have a “high show” routine and a “low show” routine for overcast conditions when a low cloud deck prevents them from being visible from the ground. We got to see the low show on Friday practice and the high show on Saturday. 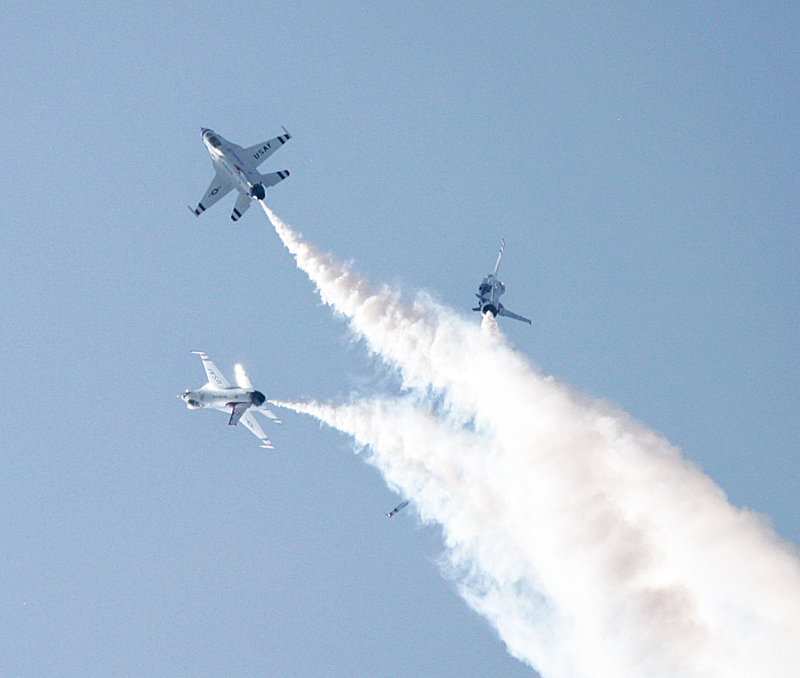 “From the left, Thunderbird #5, Major Blaine Jones, the Lead Solo, will execute a maximum performance, high-G turn.” This sequence shows the F-16 turn in under afterburners and pull up to 9G’s. In the third frame you can see the wings of the F-16 flex upward under the G-load. The two solos cross in the cross over break, one of the most spectacular and difficult to photograph maneuvers of the show. This pull-up maneuver is used to sequentially position the aircraft for entering the landing pattern and makes for a cool shot as the aircraft begin their break. 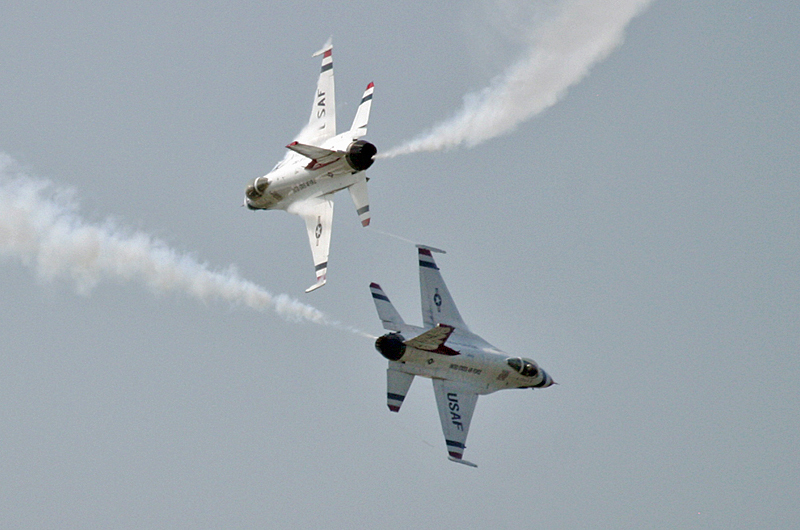 This maneuver begins in the trail formation with the aircraft behind each other and completes a loop up to 2,000 feet where the formation rejoins with incredible precision during the inverted, changing to the diamond formation. Condensation formed on the wingtips streams off the aircraft at higher altitude as the air cools. 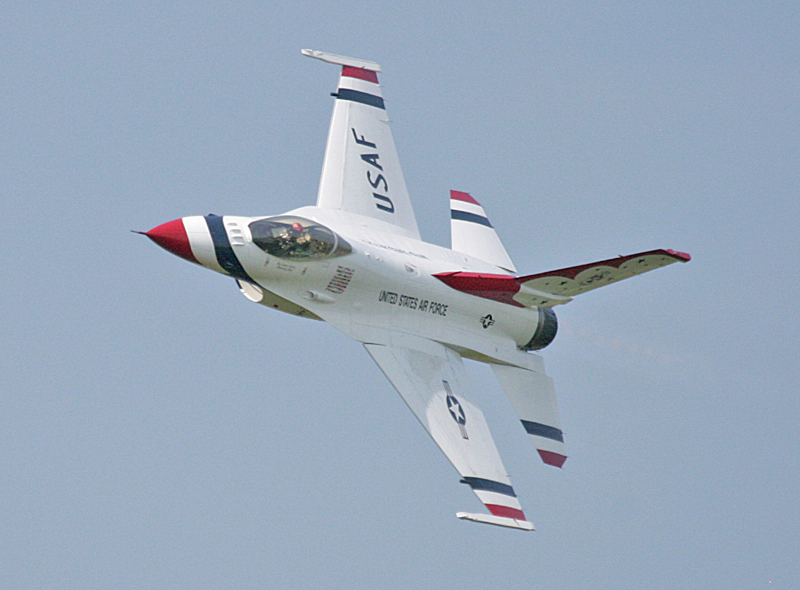 The opposing solo high-alpha pass: Thunderbird #5 flies across show center at about 100 MPH or nearly the minimum speed the aircraft can maintain and still stay in the air. The speed brakes at the back of the aircraft are deployed to slow it down. 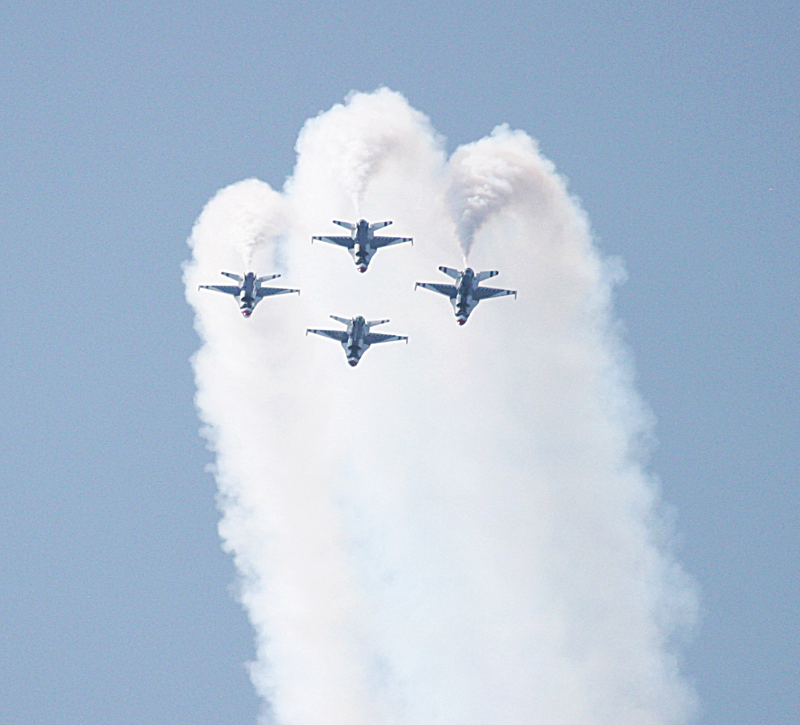 Thunderbird #6, the opposing Solo, trails condensation vapor as it pulls up to the vertical to rejoin the four-ship diamond formation. All six aircraft form the wedge formation high into the afternoon sun with thick vapor trails coming off their wingtips. 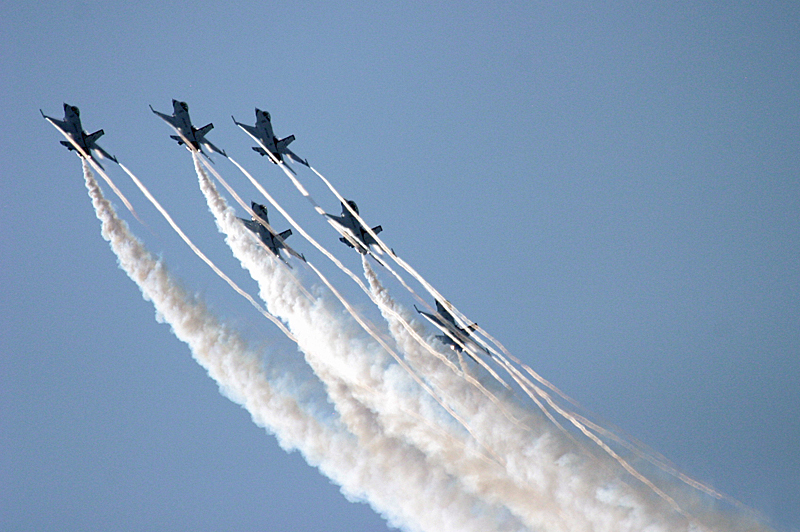 The six-aircraft wedge formation passes in review under slight overcast. Then flies into clear sky with a complete change of lighting. Finally the diamond formation pitches up to the vertical and executes the high bomb burst with one of the solo aircraft rolling vertically through the middle. 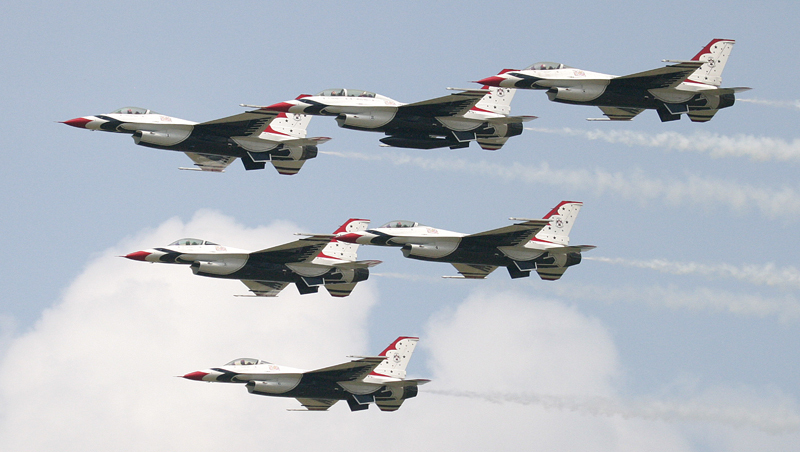 It was a classic Thunderbird finale. Back on the ground with the chocks in place Thunderbird #1 prepares to shut his engine down at the end of the flight demonstration. 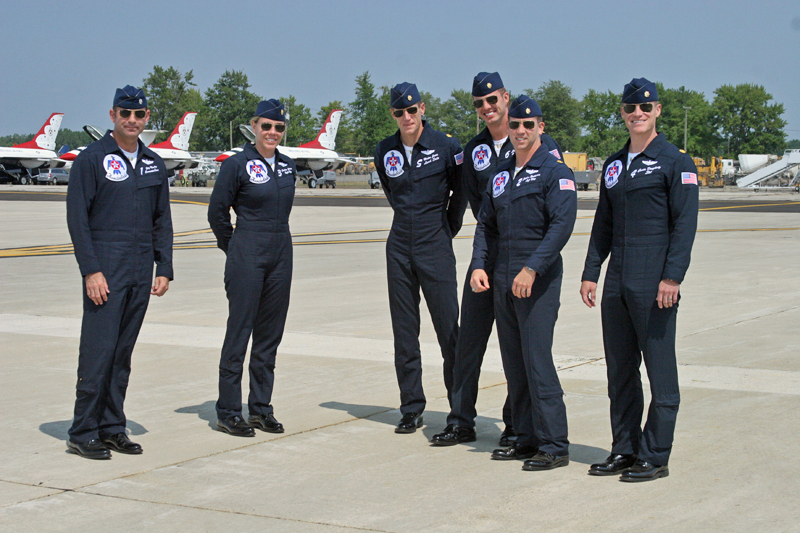 It’s a tradition to wait after the airshow and meet the Thunderbird pilots in person for a handshake, photo and an autograph. 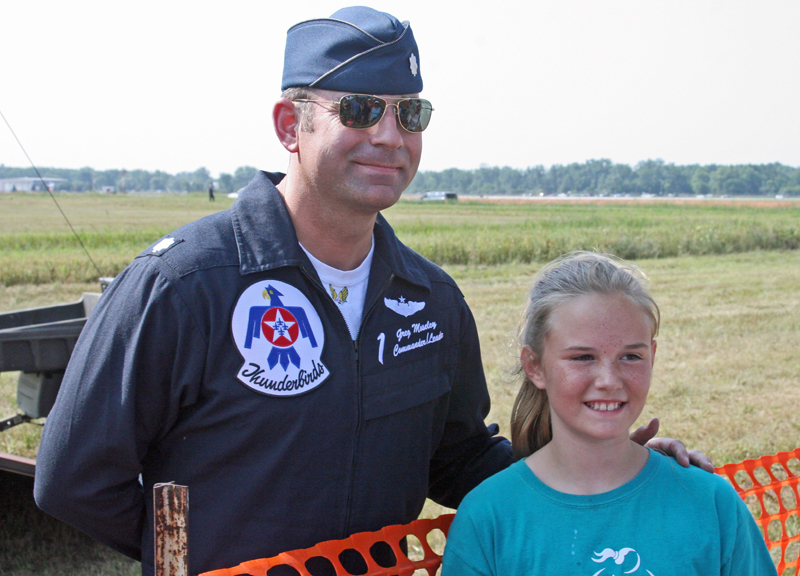 Here the Thunderbird team leader, #1 Lt. Col. Greg Mosley, poses for a photo with a fan. 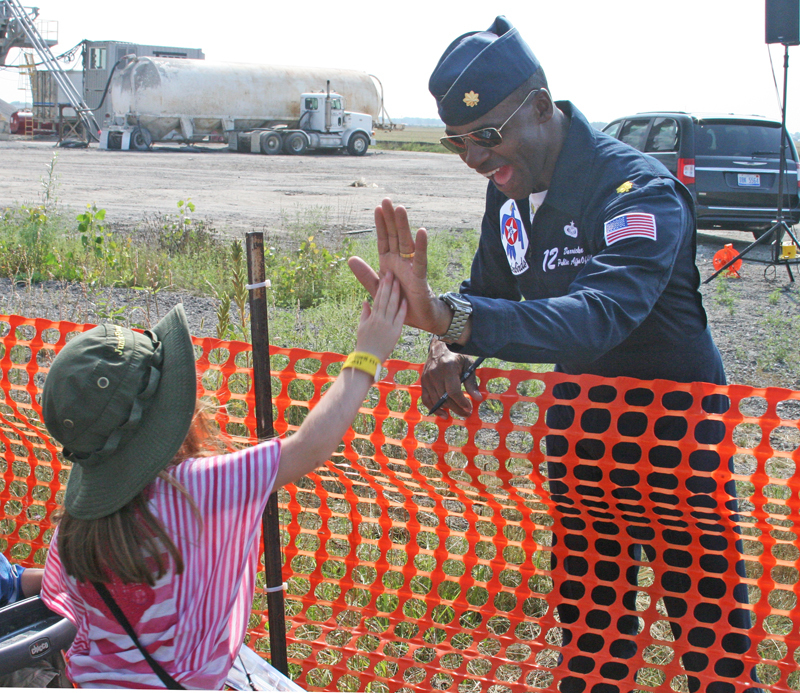 Thunderbird 12, Major Darrick Lee, high-fives a fan at the end of the airshow. On my way out of the show I met aviation artist David Ails. 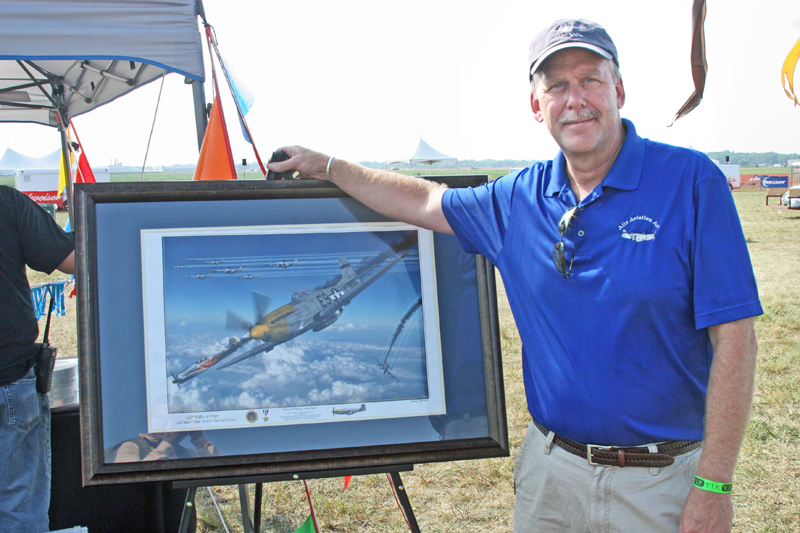 Ails was displaying and selling some of his incredible digital aviation art depicting aircraft including the P-61 Black Widow and F-4 Phantom. Ails represents a new breed of aviation artist who uses digital media for creation of incredible images that depict historic aviation events and aircraft. The greatest fear I had going into Jack Ryan: Shadow Recruit was that it would be a sad eulogy to Tom Clancy’s genius. I’m pleasantly surprised to be wrong. Director Kenneth Branagh did his homework and borrowed subtle and successful elements from each of the Jason Bourne, James Bond, Mission Impossible and Tom Clancy franchises to weave a surprisingly good story thread that is visually well done. 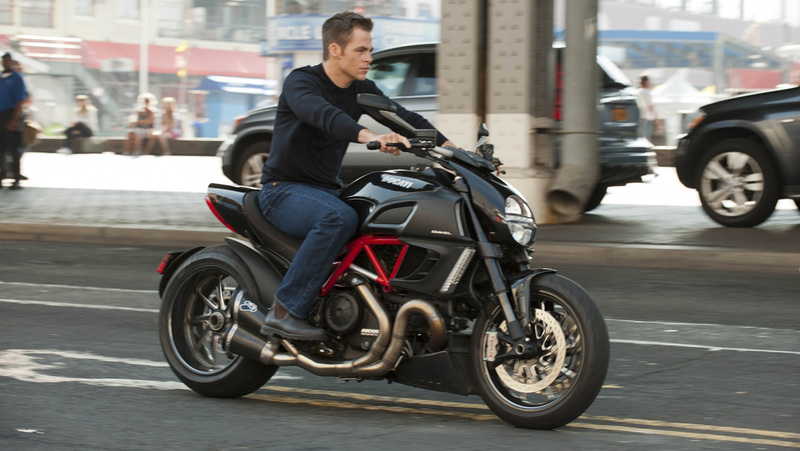 Jack Ryan: Shadow Recruit is a tight and snappy spy thriller. It’s well written, tightly shown and quickly paced. Camera, sound and production techniques are tasteful and pay homage to its influences. Very little is over blown. Even the sets are well dressed and chosen. Writers David Koepp and Adam Cozad used Tom Clancy’s character Jack Ryan with reverence for Clancy’s original vision of Dr. Ryan, the nerdy analyst turned reluctant but capable action hero. Jack Ryan gets his first kill James Bond style, in a bathroom. Chris Pine as Jack Ryan is fantastic as is Kevin Costner as Thomas Harper, his CIA boss. And because no great spy film is a success without great villains, it is a pleasure to have Kenneth Branagh as the dangerous Russian, Viktor Cherevin. The plot hits ominously close to home, literally and figuratively, with a story line that weaves into the little known world of economic warfare. Villains originate from Dearborn, Michigan in the shadow of Ford World Headquarters. 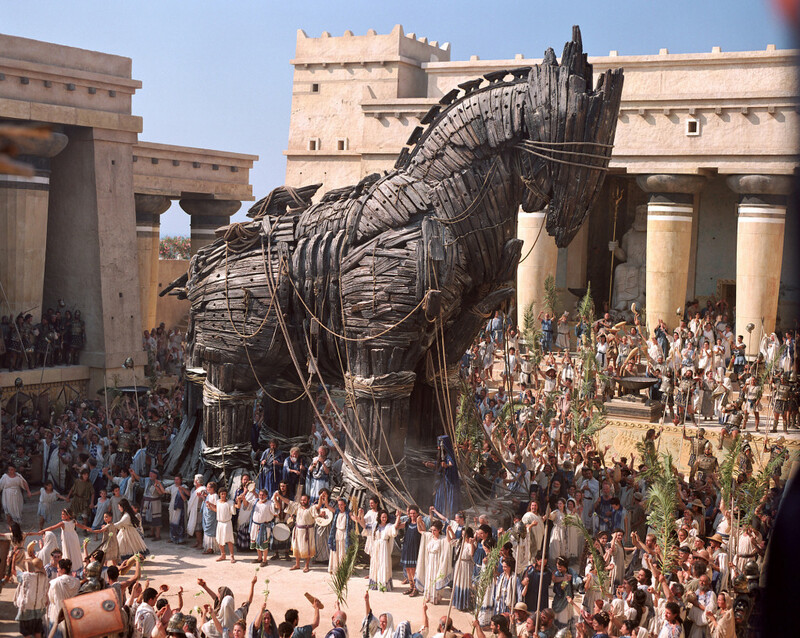 The plan is to crash the stock market in a combined terror and economic attack; a scenario everyone hopes will remain fiction. But Tom Clancy’s fiction has an ominous way of weaving its way into the headlines. Jack Ryan: Shadow Recruit never sags and builds well to a strong climax. There are a few corny moments but remember, this isn’t a strict Clancy plot. It weaves influences from every corner of the spy thriller genre, and does it with respect and tribute to each. While these stories do become somewhat cookie-cutter this one is flavored uniquely and with enough craft to make it a snappy 105-minutes. And yes, there is a sequel planned that hopefully continues with this fine cast in the upcoming Without Remorse. Tom Clancy would have loved Jack Ryan: Shadow Recruit. It is tight, quick and nice looking. This is a pleasant surprise after the painful loss of a great author and storyteller who created these characters. That new writers are able to execute on Clancy’s vision confirms their talent and reverence for his mastery. Taking to the streets with a nod to Bourne franchise in “Shadow Recruit”. Peter Berg’s “Lone Survivor”; Clunky and Synthetic. Early July 2005: I was in the car. CNN was on. There was a report of a “U.S. long range reconnaissance team lost in Afghanistan”. They went to a commercial. I pictured what must have been going on. 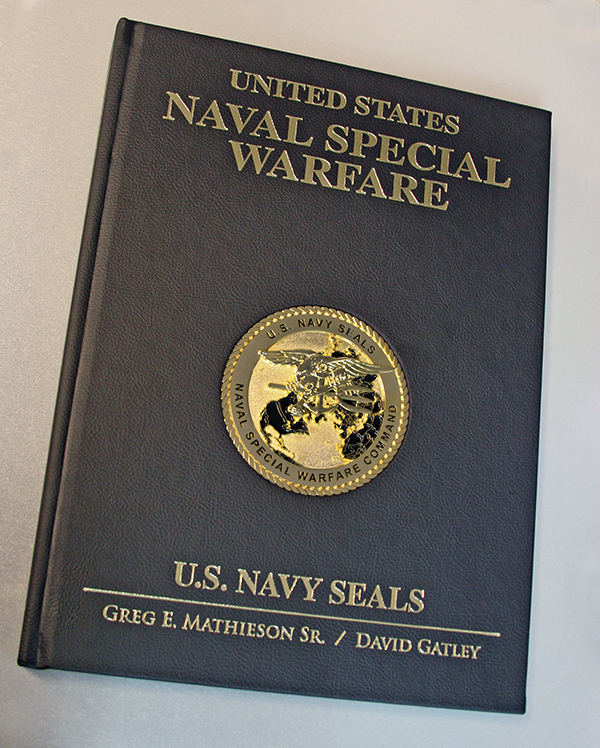 Marine recon, Army Special Forces, Naval Special Warfare, Air Force Special Operations. It was one or some combination of them. They had no comms, they were cut off, they may be lost, their food was gone. They may not even be alive by the time it made the news. In the mid to late 1980’s I was a member of a U.S. Army National Guard Long Range Surveillance Team, Co. F., 425th INF (RANGER/AIRBORNE), Michigan National Guard. I was the scout/observer for our five man reconnaissance team. We never saw combat then. But the sense of being a long way from home, cold, wet, hungry and with no communications is a very familiar one. Our radios never worked. We rarely got comms. We often walked home, even on training missions. In 2007 when Marcus Luttrell wrote his book Lone Survivor I read it in one sitting, and didn’t sleep well for days. His account of a long range surveillance mission gone bad is harrowing and realistic. 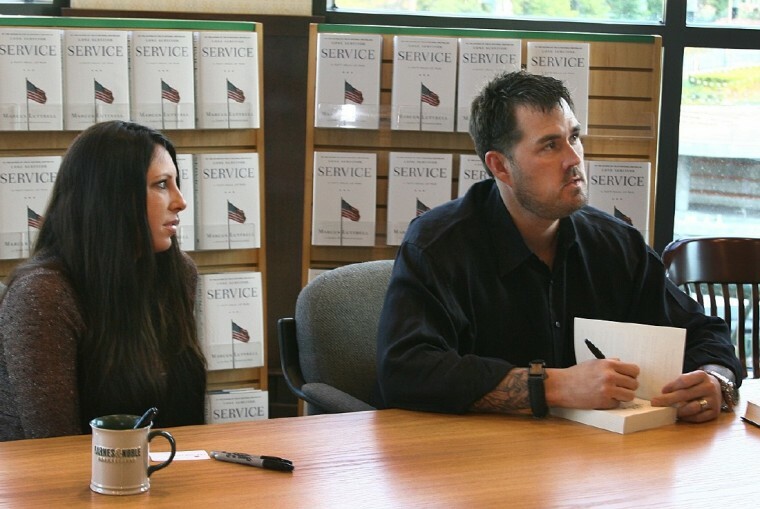 “Lone Survivor” author Marcus Luttrell signs his new book “Service”. Luttrell’s incredible account of Operation Red Wings deserved a better film adaptation. This weekend Director Peter Berg’s adaptation of Lone Survivor hit theaters. Berg is the mastermind behind the impressive and haunting film The Kingdom from 2007. Berg executes the complex story of Operation Red Wings told in Luttrell’s Lone Survivor with the level of authenticity you expect for a 121-minute Hollywood movie. There are moments when the film “works”, sort of. But for the most part it is clunky, forced and unrealistic feeling. Berg may get a pass because faithfully depicting the horror of a small recon team retreating down a cliff side in the high Afghan mountains of Kunar Province is technically demanding. But remember Steven Spielberg’s D-Day landing scene in Saving Private Ryan, a scene so real it makes you recoil in terror and smell the cordite, exhaust fumes and gore. Even Ridley Scott’s Blackhawk Down, while very “Hollywood-ized” provides a more authentic and vertiginous sense of what combat must be like. Both Saving Private Ryan and Blackhawk Down “feel” more realistic. Lone Survivor relied too heavily on bad set dressing, rotten camera movement, poor make-up and a generally inauthentic “look” to deliver. 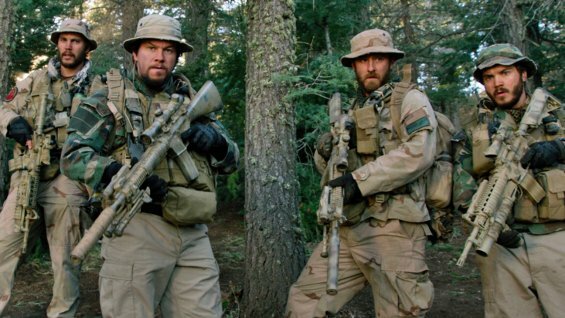 The cast of “Lone Survivor” look more like an airsoft convention than a Long Range Surveillance Team. The shape and storyline of Lone Survivor is good but the look and feel is shallow and contrite. There is so much “punch” and terror to this story it could have been done better. The digital effects, especially of aircraft and wide scenes, are embarrassingly poor by current standards. Lone Survivor simply looked “hurried” and synthetic. The make-up effects of wounds and blood looked like something you’d see in a Halloween haunted house. Even after three days of a long range reconnaissance patrol the characters didn’t look authentically dirty and grimy. Another nick against Lone Survivor is that the “Afghanis” didn’t look like they lived in the mountains of Kunar Province. They looked like people from an L.A. cattle call for “Afghan” extras for a film shoot. For reference on how to get it right look at the realistic pirate depictions in Paul Greengrass’ Captain Phillips . Barkhad Abdi and Barkhad Abdirahman were authentic and believable in their roles as Somali pirates, in no small part because they are from Somalia. Peter Berg’s Lone Survivor is not a total failure. The audience in the theater spontaneously applauded when the credits rolled, so it got their attention. But it isn’t the authentic and horrifying insight into Long Range Surveillance and Marcus Luttrell’s incredible book that I had hoped for.